NODAL/Activin signaling orchestrates key processes during embryonic development via SMAD2. How SMAD2 activates programs of gene expression that are modulated over time however, is not known. Here we delineate the sequence of events that occur from SMAD2 binding to transcriptional activation, and the mechanisms underlying them. 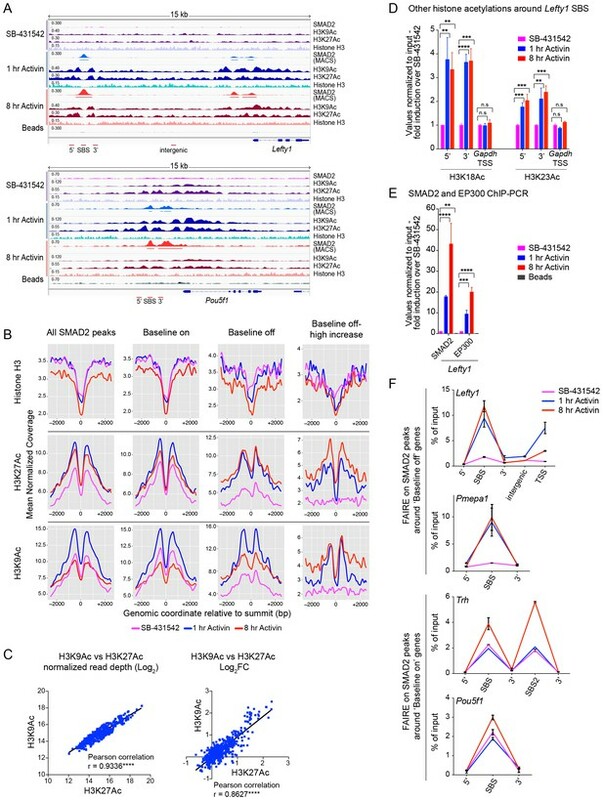 NODAL/Activin signaling induces dramatic chromatin landscape changes, and a dynamic transcriptional network regulated by SMAD2, acting via multiple mechanisms. Crucially we have discovered two modes of SMAD2 binding. SMAD2 can bind pre-acetylated nucleosome-depleted sites. However, it also binds to unacetylated, closed chromatin, independently of pioneer factors, where it induces nucleosome displacement and histone acetylation. For a subset of genes, this requires SMARCA4. We find that long term modulation of the transcriptional responses requires continued NODAL/Activin signaling. Thus SMAD2 binding does not linearly equate with transcriptional kinetics, and our data suggest that SMAD2 recruits multiple co-factors during sustained signaling to shape the downstream transcriptional program. To allow a complex animal to develop from a small bundle of cells, the cells need to be able to communicate with each other to coordinate their activities. Furthermore, this communication needs to continue in adulthood to keep the body in balance and to prevent diseases such as cancer. The cells communicate by releasing signals that influence the behavior of their neighbors by activating proteins called transcription factors. These proteins then change the activity of particular genes in the nucleus by binding to specific places on a structure called chromatin (the structure in which the genes are packaged). One group of signaling molecules is known as the transforming growth factor beta superfamily, which is crucial for embryos to develop correctly. Failure to control these signals can also promote the growth of tumors. However, it is not clear how the detection of these signals at the surface of the cell leads to changes in the activity of genes inside the nucleus. Two transforming growth factor beta signals called Activin and NODAL cause a transcription factor known as SMAD2 to move into the nucleus where it can alter gene activity. Here Coda, Gaarenstroom et al. investigated how SMAD2 transmits the Activin/Nodal signal in mouse cancer cells. The experiments showed that SMAD2 can change the activities of genes in multiple ways. SMAD2 can bind to places in the chromatin that are either easy to access (which typically contain genes that are already “switched on”) as well as areas that are difficult to access (which generally contain genes that are “switched off”). As a result, SMAD2 increases the activity of genes that were already active, but also switches on on genes that were previously inactive. Coda, Gaarenstroom et al. also found evidence that SMAD2 remained bound to chromatin after long periods of Activin/NODAL signaling. For some genes, this resulted in high gene activity, but in other cases this decreased the gene’s activity. Therefore, future experiments will investigate which other proteins help SMAD2 to change gene activity at later times. Patterning of tissues during embryonic development depends on the control of gene expression by extracellular signals. The signaling molecules involved frequently act as morphogens to impart positional information (Ashe and Briscoe, 2006). It is becoming clear that the resultant programs of gene expression evolve over time, and that transcriptional output is less a function of absolute ligand concentration, than duration of ligand exposure and signal transduction dynamics (Cohen et al., 2013; Nahmad and Lander, 2011). Genome-wide interrogation of transcription factor (TF) binding sites and distribution of histone modifications in many different cell types has greatly informed our knowledge of the mechanisms underlying transcription regulation (van Dijk et al., 2014). However, most of these studies have been performed at steady state and we know little about the sequence of events that occur from TF binding to the induction of dynamic programs of gene expression. This is best studied using TFs that are activated in response to extracellular signaling and the NODAL signaling pathway provides an excellent model system. NODAL is a member of the transforming growth factor β (TGF-β) superfamily which plays crucial roles in early embryonic development. It is required at low levels for maintenance of pluripotency in both early embryos and embryonic stem cells (ESCs), and at higher levels for mesendoderm differentiation and left–right patterning (Arnold and Robertson, 2009; Schier, 2009). Moreover, in zebrafish embryos, the time of ligand exposure dictates the cell fates specified, with endoderm requiring a longer duration of NODAL signaling than mesoderm (Hagos and Dougan, 2007). How one signal can induce both self-renewal and differentiation to different cell fates is not understood. NODAL and the highly-related ligand Activin, which in vitro mimics the functional activities of NODAL, signal via heterotetrameric receptor complexes. These comprise type I and type II receptors, with NODAL additionally requiring the co-receptor TDGF1 (previously called Cripto) (Schier, 2009). Ligand binding leads the type II receptor ACVR2A/ACVR2B to phosphorylate and activate the type I receptor ACVR1B, which in turn recruits and phosphorylates the intracellular transducers, SMAD2 and SMAD3 (Wu and Hill, 2009). Once phosphorylated, SMAD2/3 form complexes with SMAD4 and accumulate in the nucleus, where they directly regulate transcription (Ross and Hill, 2008). SMAD3 and SMAD4 contact DNA through their N-terminal Mad homology 1 (MH1) domain, recognizing the sequence AGAC/GTCT (Zawel et al., 1998). SMAD2, in contrast, cannot bind DNA directly (Yagi et al., 1999) and requires interaction with additional TFs to recruit it to DNA (Gaarenstroom and Hill, 2014). The Forkhead TF FOXH1 was the first such cooperating TF to be identified, and is essential for the induction of a subset of NODAL/Activin target genes during gastrulation (Attisano et al., 2001; Chen et al., 1996). Other SMAD2-recruiting TFs include MIXER, POU5F1/OCT4, NANOG, EOMES and TEAD proteins, which have distinct DNA binding specificities compared with FOXH1 (Beyer et al., 2013; Brown et al., 2011; Faial et al., 2015; Germain et al., 2000; Kunwar et al., 2003; Mullen et al., 2011). It remains unclear how activated SMAD complexes find their binding sites on DNA, in particular, whether the recruiting TFs are pre-bound or whether they bind simultaneously with the SMADs. One study proposed that SMAD complexes can only bind to sites already occupied by Master TFs (Mullen et al., 2011). However, this model ascribes a purely modulatory role for TGF-β superfamily pathways, which is at odds with the clear driving role of NODAL/Activin signaling in early development (Schier, 2009). We previously established that SMAD2–SMAD4 complexes are unable to activate transcription on a naked DNA template, but instead require the context of chromatin (Ross et al., 2006), indicating that SMADs regulate gene expression through chromatin remodeling. Consistent with this idea the SMADs are known to recruit a number of chromatin modifiers and remodelers including the histone acetyltransferase (HAT) EP300 (previously called p300), the ATP-dependent helicase SMARCA4 (previously called BRG1), the H3K27 demethylase JMJD3 and Mediator components (Feng et al., 1998; Xi et al., 2008; Ross et al., 2006; Dahle et al., 2010; Kato et al., 2002; Kim et al., 2011). Moreover, recent studies in ESCs suggest that NODAL–SMAD2 signaling affects the H3K4Me3 status of target genes through the methyl transferase DPY30 (Bertero et al., 2015). However, what dictates the target gene specificity of these collaborating factors has not been determined, nor is it known whether they precede or follow SMAD2 binding to DNA. Furthermore, the sequence of events occurring on chromatin that connects SMAD complex binding to chromatin modifications to target gene regulation is completely unknown. Here we have taken a genome-wide approach to discover how a dynamic transcriptional program is executed in response to acute and prolonged NODAL/Activin-SMAD2 signaling. We have used the murine P19 embryonic teratoma cell line, which express pluripotency and mesendodermal genes in response to NODAL/Activin signaling. Most significantly, in contrast to ESCs, they do not differentiate when treated with the NODAL/Activin type I receptor inhibitor, SB-431542 (Vallier et al., 2005), making them ideal for analyzing transcription from a signal-inhibited baseline. We have performed RNA-sequencing (RNA-seq) and chromatin immunoprecipitation sequencing (ChIP-seq) for SMAD2, two different phosphorylation states of Pol II and various histone modifications in signal-inhibited cells and upon acute and chronic NODAL/Activin signaling. We identify a dynamic transcriptional program downstream of NODAL/Activin signaling which requires a continuous signaling input for its implementation. We go on to define the sequence of events that occur from SMAD2 binding to transcriptional activation, and the mechanisms underlying them. Our work establishes new paradigms for signal-dependent transcriptional regulation. We first assessed pathway activation in P19 cells over time in response to Activin from a signal-inhibited baseline resulting from overnight treatment with SB-431542. We focused on SMAD2 phosphorylation (pSMAD2) as SMAD2 is the predominant receptor-regulated SMAD downstream of NODAL/Activin in these cells (Figure 1—figure supplement 1A). Robust induction of pSMAD2 was detected within 30–60 min, which attenuated to lower levels at later time points (Figure 1A). Both pSMAD2 induction and target gene expression were partly dependent on Activin dose (Figure 1—figure supplement 1B and C). P19s exhibit chronic signaling in the untreated state which results from autocrine ligand production. This is characterized by low levels of pSMAD2 and intermediate levels of target gene expression, and is also evident upon SB-431542 washout (Figure 1A, lane 1; Figure 1—figure supplement 1B and C, see lanes marked ‘media’). The ligands responsible are NODAL and GDF3, which signal via ACVR1B, ACVR2A/B and TDGF1 (Schier, 2009) (Figure 1—figure supplement 2A–C). Note that as Tdgf1 expression is controlled by NODAL/Activin signaling and TDGF1 is a very unstable protein, it is rapidly degraded when signaling is terminated (Figure 1—figure supplement 2D). As a result P19 cells respond to Activin, but not to NODAL or GDF3, when acutely stimulated from the SB-431542-treated state. The transcriptional response to acute, sustained and chronic NODAL/Activin signaling in P19 cells. (A) Western blot showing SMAD2 phosphorylation timecourse upon Activin induction in P19 cells. Cells were treated as indicated and lysates were blotted using the antibodies shown. Arrows indicate the conditions used for the RNA-seq. Below, the phosphorylated SMAD2 (pSMAD2) signal was quantified relative to total SMAD2/3. Untr, untreated (chronic signaling). (B) RNA-seq was performed on P19 cells either untreated or incubated overnight with SB-431542, washed out, then replaced with full media containing SB-431542 for 1 hr (SB-431542 sample), or with full media containing Activin for 1 hr or 8 hr. Shown is a hierarchically-clustered heatmap of log2FC values (relative to SB-431542) for each time point for 747 differentially-expressed genes. (C) log2FC values relative to SB-431542 at each time point plotted for the target genes falling within each of four distinct kinetic clusters. Untr, untreated. (D) Following RNA-seq of control, cycloheximide- or emetine-treated samples in the SB-431542, 1 hr Activin and 8 hr Activin conditions, genes were defined as ‘direct’ or ‘indirect’ depending on whether their pattern changed upon protein synthesis inhibition. Displayed are the relative proportions of direct and indirect target genes in each kinetic cluster. (E) Cells were treated with or without cycloheximide as in (D) and processed for qPCR. Transcript levels for a subset of target genes were quantified relative to Gapdh. Plotted are the means and SEM of two independent experiments performed in duplicate. n.s., not significant. **** corresponds to a p value of < 0.0001; *** corresponds to a p value of < 0.001 and ** corresponds to a p value of < 0.01. (F) Cells were treated overnight with SB-431542, washed out, then stimulated for the indicated times with Activin (blue line) or SB-431542 was added to the Activin-containing media after 1 hr of Activin treatment (red line). qPCR was performed for the genes shown, which are representatives of each of the four distinct transcriptional profiles. Plotted are the means and SEM of three independent experiments performed in duplicate. *** corresponds to a p value of < 0.001 and ** corresponds to a p value of < 0.01. The gene expression profiles (Figure 1—figure supplement 1C) demonstrated that different genes are expressed with distinct kinetics, indicating that this cell system has great potential for investigating transcriptional responses to both acute, sustained and chronic NODAL/Activin signaling. To address this on a genome-wide scale we performed RNA-seq in four different conditions: SB-431542-treated cells; 1 hr Activin-treated; 8 hr Activin-treated and untreated (chronic signaling). We identified 747 genes significantly differentially expressed at at least one timepoint relative to the SB-431542-treated state (Figure 1B; Supplementary file 1). Expression changes for a subset of genes following Activin treatment were validated by qPCR (Figure 1—figure supplement 3). Among those upregulated were genes involved in pluripotency and mesendoderm induction, suggesting an ESC-like signature, and gene ontology analysis identified the enrichment for developmental and TGF-β superfamily-regulated processes (Supplementary file 2). To facilitate downstream analysis, we classified the target genes into four categories: ‘induced sustained’ (acutely upregulated genes whose transcription persists over time); ‘delayed’ (genes only significantly induced after prolonged signaling); ‘transient induced’ (acutely upregulated genes whose transcription subsequently declines); ‘repressed’ (genes that are actively inhibited in response to signaling) (Figure 1C). These distinct profiles are not a result of the different half-lives of the mRNAs, as we find no correlation between mRNA half-life and transcription profile (Figure 1—figure supplement 4A). It was evident that, with the exception of the delayed genes, sustained signaling resulted in either repression or dampening of transcription. Even in the ‘induced sustained’ category where transcript levels were higher after 8 hr of Activin signaling compared with 1 hr, the rate of accumulation of transcripts decreased after 1 hr of Activin stimulation. Consistent with the modulation of gene expression profiles over time, we found that transcription of a substantial proportion of the delayed and repressed genes was perturbed by the presence of protein synthesis inhibitors (Figure 1D). A subset of delayed target genes was no longer induced, and many repressed genes, either those inhibited by Activin signaling, or those whose transcription declined following a transient induction, were no longer repressed. These patterns were validated by qPCR (Figure 1E). Extending these results further we investigated whether the distinct profiles of gene expression in response to Activin/NODAL signaling required continuous activity of the pathway. Taking representative examples of target genes in each of the four categories, we found that inhibiting signaling after 1 hr of Activin stimulation with SB-431542 had a dramatic effect on the subsequent transcriptional profile of the target genes. Induced sustained genes require continuous SMAD2 signaling for their long-term transcription, and delayed genes require extended signaling to be induced at all (Figure 1F; Figure 1—figure supplement 4B and C). For transiently induced genes like Smad7 and Hes1 we found that when signaling was terminated after 1 hr their levels fell rapidly to baseline, presumably because of the very short half-life of these mRNAs, whereas in the context of continuous signaling, these genes were repressed in a more gradual fashion (Figure 1F; Figure 1—figure supplement 4). Transcriptional repression of genes like Fgfr2 also required on-going signaling (Figure 1F). Thus, modulation of the transcriptional responses over time depends on continuous signaling (see further below). 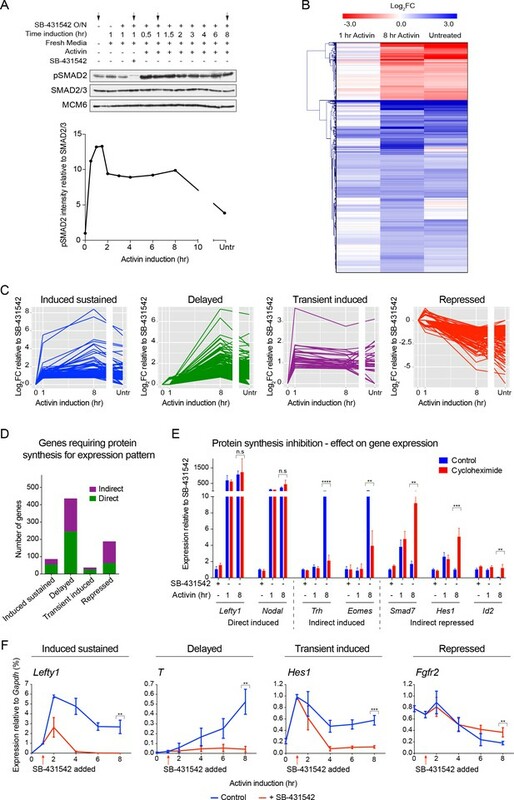 Taken together these data indicate that Activin stimulation directly induces/represses transcription, and drives a program of secondary events that remodel the transcriptional response over time. To address how Activin induces such a complex program of gene expression we performed ChIP-seq for SMAD2 at the same time points used for the RNA-seq. Activin-induced SMAD2 binding was detected around known direct Activin-responsive genes such as Lefty1 and Pmepa1, thus validating the dataset (Figure 2A; Figure 2—figure supplement 1A,B). SMAD2 binding for selected target genes was corroborated by ChIP-PCR (Figure 2—figure supplement 1C). We next defined peaks of significant SMAD2 enrichment relative to input chromatin (Zhang et al., 2008). No peaks were identified in the SB-431542 condition, and 846, 5485 and 2869 SMAD2 peaks were detected at 1 hr Activin, 8 hr Activin and chronic (untreated) signaling states respectively, of which 532 overlap at all three timepoints (Figure 2B and C). The majority of binding events occur at regions distal to transcriptional start sites (TSSs), with 70–78% (depending on the condition) identified within 100 kb of an annotated gene (Figure 2C). Combining RNA-seq with ChIP-seq for SMAD2 and Pol II leads to the definition of a high confidence dataset. (A) IGV browser display of the Lefty1/Lefty2 genomic locus, showing tracks and MACS-called peaks for SMAD2 and tracks for Pol II Ser5P. Red lines below are regions for which ChIP-qPCR primers were designed. (B) SMAD2 ChIP-sequencing was performed on P19 cells in the same conditions as the RNA-seq (Figure 1). The numbers of peaks in each condition are shown in the Venn diagram. (C) Distribution of SMAD2 peaks based on their genomic annotation to upstream or downstream intergenic regions, TSS (considered TSS ± 500 bp), exonic or intronic location. (D) Metaprofiles for the SMAD2 peaks in the high confidence dataset. Normalized read counts centred on the peak ± 2 kb are shown for the four different experimental conditions. (E) Plots displaying the density of SMAD2 peaks in the high confidence dataset and their distance from the annotated TSS of the nearest regulated target gene within a ± 100 kb window for each condition. All genes are modeled as 20 kb from TSS to TTS. Insets show density of SMAD2 peaks ±10 kb centred around the TSS of the modeled target genes. (F) Distribution of the high confidence dataset of 140 SMAD2-regulated genes within each of the four categories, or segregated according to ‘baseline on’ or ‘baseline off’ in the SB-431542 state. (G) Left panel: Deletion of the upstream Lefty1 SBS in three independent clones inhibits Activin-induced Lefty1 transcription, but not Lefty2 transcription. Right panel. Deletion of the upstream Lefty2 SBS in three independent clones inhibits Activin-induced Lefty2 transcription, but not Lefty1 transcription. Transcript levels were quantified relative to Gapdh. A representative experiment (means ± SD) is shown. Untr, untreated. To link the SMAD2 binding sites (SBSs) to Activin-regulated genes, SMAD2 ChIP-seq data were integrated with the RNA-seq data, along with Pol II ChIP-seq data. For the latter, we performed ChIP-seq for the largest subunit of Pol II specifically phosphorylated on Ser5 or Ser2 of its C-terminal domain (CTD) to differentiate between initiating and elongating forms of Pol II respectively (Levine, 2011) (Figure 2A; Figure 2—figure supplement 1D). By identifying regions of enriched Pol II over gene bodies in stimulated states relative to the SB-431542 state, we defined genes regulated by the pathway. The SMAD2 peaks were associated with the closest regulated gene using a cut-off of 100 kb from an annotated TSS or transcription termination site (TTS). In this way we identified 140 NODAL/Activin transcriptional targets, associated with 478 SMAD2 peaks for further analysis (high confidence dataset; Supplementary file 1). A metaprofile of normalized readcounts associated with these peaks is shown in Figure 2D. We found that approximately 50% of these SMAD2 peaks were detected within a 10 kb window around the TSS of the regulated gene (Figure 2E). The 140 regulated genes were classified into the four different gene expression categories defined above, and we additionally noted that 29 of the induced genes were activated from an undetectable baseline in the SB-431542 state (‘baseline off’ – see further below) (Figure 2F). To validate the association of SMAD2 peaks with regulated genes we used CRISPR/Cas9 to delete the two major SBSs upstream of Lefty1 and Lefty2 (Figure 2—figure supplement 2). Deleting the Lefty1 SBS on both alleles in three individual clones resulted in loss of Activin-induced Lefty1 expression, without affecting Lefty2 or other Activin targets (Figure 2G; Figure 2—figure supplement 2). We obtained the converse when the upstream Lefty2 SBS was deleted (Figure 2G; Figure 2—figure supplement 2). Thus we found a one-to-one relationship between SBSs and the genes they regulate, which gave us confidence in our method for associating SMAD2 peaks with target genes. Focusing first on the acute transcriptional regulation in response to NODAL/Activin signaling we used the Pol II ChIP-seq analyses to investigate the mechanism by which SMAD2 binding activates transcription. Rapid signal-induced transcription is often characterized by a pause–release mechanism for Pol II activation (Levine, 2011). In this scenario, activated Pol II phosphorylated on Ser5 within its CTD is enriched on target genes just downstream of the TSS, associated with pausing factors. Upon active signaling, TF binding induces dissociation of the pausing factors and recruits proteins that positively regulate Pol II elongation, characterized by Ser2 phosphorylation (Adelman and Lis, 2012). Metaprofiles were used to visualize enrichment of initiating Pol II (Ser5P) and elongating Pol II (Ser2P) on all genes and they showed the characteristic patterns, peaking at the TSS and TTS respectively (Descostes et al., 2014) (Figure 3A). We noted that the relative changes in Pol II Ser5P and Pol II Ser2P for the differentially-regulated target genes followed similar patterns (Figure 3B), and the Ser2P and Ser5P values correlated well (Figure 3C). These observations suggested that Pol II recruitment is the dominant mechanism for transcriptional activation in response to Activin, because for a pause–release mechanism we would expect Pol II Ser5P and Pol II Ser2P to be differentially enriched (Sawicka et al., 2014). We addressed this directly using metaprofiles to examine the relative enrichment of Pol II Ser5P and Pol II Ser2P around the TSSs of target genes subdivided with respect to their kinetic expression pattern. Most importantly there was no paused Pol II Ser5P at the TSS in the SB-431542-treated state for the genes with a silent baseline (‘baseline off’) nor any enrichment of Pol II Ser2P in these conditions (Figure 3D). For the ‘baseline on’ genes, where a peak of Pol II Ser5P was seen at the TSS in the SB-431542-treated state, this was accompanied by enrichment of Pol II Ser2P throughout the body of the gene and a peak at the TTS, indicating on-going transcription of these genes as expected (Figure 3D). Moreover, the shape of the profiles did not change with ligand induction; the amplitude simply increased, which reflects changes in Pol II recruitment. For the other categories, the enrichment of Pol II Ser5P generally followed the gene expression dynamics (Figure 3D). Activin-SMAD2 signaling regulates Pol II via de novo recruitment. (A) Average metaprofiles for each of two replicates from the 1 hr Activin sample of the ChIP-seq for Ser5P or Ser2P isoforms of Pol II. Normalized read count across all genes is shown. The orange line denotes the input. (B) Activin-SMAD2 target genes from the high confidence dataset showing differential Pol II binding were hierarchically-clustered and the log2FC relative to SB-431542 for mean normalized read depth for Pol II Ser 5P and Pol II Ser2P is displayed in a side-by-side comparison with the transcript levels (determined by RNA-seq). (C) Correlations of the log2FC values of affected target genes for Pol II Ser2P and Ser5P for each individual time point. (D) Metaprofiles generated for Pol II Ser5P or Pol II Ser2P ChIP-seq data across a 5 kb window surrounding the TSS or the TTS for indicated subsets of target genes. Each colored line traces the normalized read depth of Pol II Ser5P or Pol II Ser2P in each condition. Taking all these data together we conclude that Activin/NODAL signaling regulates transcription of target genes in response to signaling via de novo recruitment of Pol II, rather than via pause–release. We next investigated how SMAD2 regulates the long-term transcriptional responses to Activin signaling, in particular determining whether transcriptional repression correlated with loss of SMAD2 binding. This is a crucial question in the light of the results above showing that modulation of the transcriptional profiles over time requires on-going Activin signaling. To quantitate SMAD2 binding for each gene we defined a SMAD2 footprint that incorporates both peak intensity and peak number associated with the regulated gene. We compared how the SMAD2 footprint changed over time relative to transcription as measured by RNA-seq and Pol II occupancy (Figure 4A and B). Although the majority of directly induced genes (induced sustained or transient induced) showed highest Pol II occupancy after 1 hr Activin signaling, mirroring pSMAD2 activation, SMAD2 binding did not correlate with the transcriptional kinetics (Figure 4; Figure 4—figure supplement 1). In many cases SMAD2 chromatin occupancy increased around genes after prolonged signal exposure when Pol II occupancy was downregulated (Figure 4A – see the transient induced and repressed gene categories). Two very clear examples of this phenomenon are Smad7 and Tbx3 (Figure 4B). This strongly suggests that secondary repression of transcription in response to Activin is not a result of loss of SMAD2 binding, but rather subsequent recruitment of repressors by chromatin-bound SMAD2. Localized SMAD2 chromatin binding does not directly correlate with transcription. (A) Hierarchically-clustered heatmaps for each of the four different kinetic groups of target genes showing log2FC values relative to SB-431542 for gene expression as determined by RNA-seq (left), mean normalized read depth for Pol II Ser5P (middle) and SMAD2 footprint (right). Untr, untreated. (B) Transcriptional dynamics of different target genes (Lefty1, Eomes, Smad7, Tbx3). (For IGV browser displays, see Figure 2A and Figure 4—figure supplement 1). Plotted are quantifications of transcript levels obtained by RNA-seq, Pol II Ser5P occupancy expressed as mean normalized read depth, and SMAD2 footprint, all depicted as log2FC relative to SB-431542. Untr, untreated. We therefore conclude that the requirement for continuous Activin signaling for modulation of long term responses is reflected in the continued presence of SMAD2 at regulatory regions of target genes. As a result, SMAD2 binding does not correlate with transcriptional kinetics. SMADs are known to activate transcription through chromatin remodeling, rather than by recruiting the basal transcription machinery (Ross et al., 2006). However, it is not known to what extent the SMADs directly induce changes in the chromatin landscape at target binding sites, and if they do, with what dynamics these occur. To answer this question we performed ChIP-seq for histone modifications in the same conditions used for the Pol II and SMAD2 ChIP-seq analyses. We analysed opposing activating and repressive histone modifications, namely H3K9Ac and H3K9Me3, as well as H3K27Ac and H3K27Me3 (Calo and Wysocka, 2013; Zentner and Scacheri, 2012). ChIP-seq for total H3 was also carried out to identify regions of nucleosome depletion. No significant enrichment was found for the repressive marks H3K27Me3 or H3K9Me3 at SBSs, or over the Activin-regulated target genes, although it was enriched at other loci (data not shown). In contrast, histone H3 acetylation was observed around the majority of SMAD2 peaks, and in many cases the signal increased in response to Activin signaling (Supplementary file 1; Figure 5A; Figure 5—figure supplement 1; Figure 5—figure supplement 2). As expected, H3 acetylation was also enriched over the gene bodies of the Activin-induced target genes (Figure 5A; Figure 5—figure supplement 2; Figure 5—figure supplement 3). Acetylation over the TSS generally followed the kinetics of gene expression (Figure 5—figure supplement 3). Changes in chromatin landscape around SBSs in response to signaling. (A) IGV browser displays for the Lefty1 and Pou5f1 loci displaying ChIP-seq tracks for SMAD2, H3K9Ac, H3K27Ac and total histone H3 for the indicated treatments. For the SMAD2 ChIP-seq the MACS-called peaks are also shown. (B) Metaprofiles denoting coverage of total histone H3, H3K27Ac and H3K9Ac in a 5 kb window surrounding the average summit across SMAD2 consensus peaks. Each line within a plot traces the normalized read depth of H3 or acetylated H3 for each treatment. The left panels show metaprofiles for all 478 SMAD2 peaks, while the other panels only show those regions found near genes which are induced from an ‘on’ baseline or from an ‘off’ baseline. 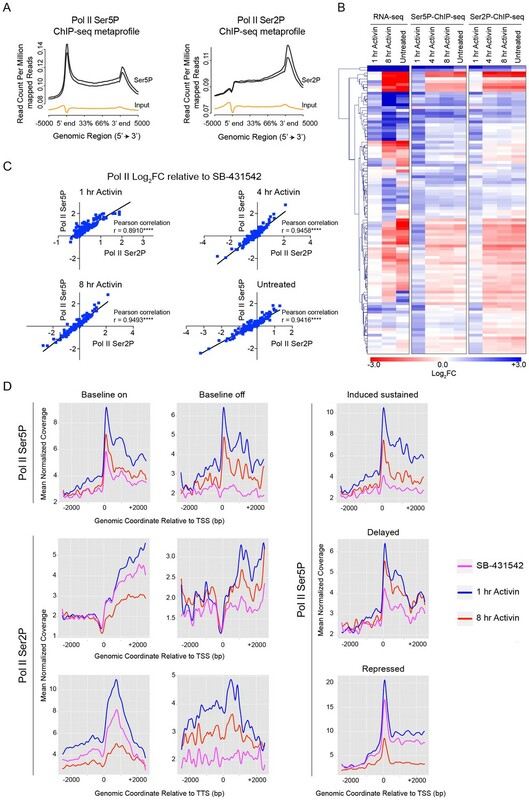 The right panels show metaprofiles for the subset of SMAD2 peaks which is associated with genes induced from an ‘off’ baseline and show changes in H3Ac enrichment from a low baseline as defined in Figure 6D. (C) Correlation plots showing normalized read depth (Log2) (left graph) or log2FC relative to SB-431542 (right graph) for H3K27Ac and H3K9Ac values, detected in the 1 hr Activin sample. (D) ChIP-PCR on the nucleosomes flanking the Lefty1 SBS (A) for H3K18Ac and H3K23Ac in P19 cells treated as indicated. Plotted are the means and SEM of three independent experiments. (E) ChIP-PCR showing enrichment of both SMAD2 and EP300 at the Lefty1 SBS in P19s treated as indicated. Plotted are the means and SEM of four independent experiments. (F) FAIRE-ChIP was performed on SB-431542, 1 hr Activin or 8 hr Activin-treated P19 cells. Soluble chromatin fractions were assayed for enrichment of the specific regions indicated which are highlighted in the IGV browser displays in panel (A) and Figure 2—figure supplement 1 and Figure 5—figure supplement 1. A representative experiment in shown (means ± SD). See Figure 5—figure supplement 1B for the averages of the three experiments and the statistical analyses. In D and E, n.s., not significant; **** corresponds to a p value of < 0.0001; *** corresponds to a p value of < 0.001 and ** corresponds to a p value of < 0.01. To assess to what extent NODAL/Activin signaling induced changes in histone modification and/or occupancy around SBSs, we generated metaprofiles for a 5 kb window centered around all loci in the high confidence dataset that have a SMAD2 peak in at least one signaling condition. When observing all SBSs together we found that they were generally nucleosome-depleted and ligand-induced histone acetylation was restricted to around 1.5 kb either side of the SBS (Figure 5B, left-hand panels). The local acetylation is also evident in the IGV browser displays (Figure 5A; Figure 5—figure supplement 2). The two H3Ac modifications were similarly induced upon acute stimulation, and ligand-induced enrichment around target sites correlated well (Figure 5C). Lysines 9 and 27 of H3 are not the only residues acetylated in response to signaling, as we also detected significant enrichment of H3K18 and H3K23 acetylation in response to Activin on the nucleosomes surrounding the Lefty1 SBS, which was used as a representative example (Figure 5D). A good candidate for inducing H3 acetylation is EP300 (Ross et al., 2006), as it is enriched over SBSs in response to acute and sustained signaling with similar kinetics to SMAD2 (Figure 5E). We next classified the SMAD2 peaks according to the kinetic profiles of the target genes, and a much more dramatic effect of signaling on histone modification/occupancy was revealed. For ‘baseline off’ genes, a robust ligand-induced decrease in H3 over SBSs was observed after 1 hr Activin stimulation, and a concomitant increase was seen in H3K9Ac and H3K27Ac at either side of the SMAD2 peak (Figure 5B). These effects were even more pronounced if we focused only on those sites which showed the highest induction of histone acetylation (see Figure 6D for definition of these peaks). This revealed a greater than two fold decrease in H3 occupancy at SBSs with ligand stimulation and an induction of histone acetylation from a flat baseline (Figure 5B, right-hand panels). Thus, SMAD2 binding in response to acute Activin signaling to transcriptionally inactive chromatin results in nucleosome displacement and induction of histone acetylation at adjacent nucleosomes. Relationship between chromatin state and SMAD2 binding strength. (A) Hierarchical clustering of average read intensity (Log2) over a 5 kb window surrounding all SMAD2 consensus peak summits for each indicated treatment is shown for H3K27Ac (left panel) and H3K9Ac (right panel). Red line, peaks associated with low overall acetylation; blue line, peaks found in highly acetylated chromatin. (B–D) Correlation between normalized SMAD2 read counts and H3 acetylation state. The SMAD2 read counts over consensus peaks in either the ‘low overall acetylation’ (red) or ‘high overall acetylation’ (blue) category were plotted for the three conditions (B). The SMAD2 read counts over consensus peaks that were defined as either low H3Ac or high H3Ac in the SB-431542 state were plotted for the 1 hr and 8 hr Activin conditions (C). The SMAD2 read counts over subsets of loci selected based on changes in H3Ac enrichment from a low baseline (D). In all cases the black bars indicate the mean and 95% confidence interval. n.s., not significant. The p-values are given in the plots. (E) ChIP-PCR for H3K4Me1 for the nucleosomes at and flanking the Lefty1 SBS or a control region within the Gapdh coding locus. A representative experiment is shown (means ± SD). The Activin-induced decrease in histone H3 over SBSs for ‘baseline off’ genes, and the increase in H3 acetylation, were verified for a subset of genes by ChIP-PCR and FAIRE-PCR. The chromatin of the Lefty1 and Pmepa1 SBSs was in a closed conformation in the SB-431542 condition with H3 present and became depleted in H3 and more accessible after 1 hr Activin treatment (Figure 5A,F; Figure 5—figure supplement 1; Figure 5—figure supplement 2). In contrast, SBSs of genes transcribed in the absence of signaling (Pou5f1, Trh) were in an open conformation that did not change following 1 hr Activin treatment (Figure 5F; Figure 5—figure supplement 1). Thus, activated SMAD2 has two distinct modes of binding. It targets sites in closed chromatin devoid of histone acetylation, whereupon SMAD2 binding induces nucleosome release and acetylation of adjacent nucleosomes. At other loci SMAD2 recognizes already nucleosome-depleted sites, flanked by acetylated histones, and induces further acetylation. To understand how SMAD2 finds its binding sites in chromatin we investigated whether there was any correlation between SMAD2 binding and histone acetylation. To this end we quantified H3K27Ac and H3K9Ac read depth in 5 kb windows surrounding all loci in the high confidence dataset with a SMAD2 peak in at least one signaling condition. Histone acetylation is highly variable in the SB-431542 state and also changes over time at many SBSs (Figure 6A). We found that overall SMAD2 binding is stronger around those loci defined by high H3K9 and H3K27 acetylation (Figure 6B). Moreover, the acetylation status in the SB-431542-treated state predicted SMAD2 binding for the 1 hr peaks, but not for the 8 hr peaks (Figure 6C). Because a subset of SMAD2 binding events occur at non-acetylated chromatin (see above), we also investigated whether higher induction of acetylation at these sites following signal activation was associated with higher enrichment of SMAD2. Indeed, SMAD2 normalized read depth was significantly higher at regions where histone acetylation is induced (Figure 6D). Taken together with the previous section, these results clearly indicated that SMAD2 binds unacetylated chromatin. This then raised the question of whether there is an additional ‘landmark’ that specifies SMAD2 target sites. We hypothesized that H3K4 monomethylation would be a good candidate, as it is known to define poised or primed enhancer sites (Calo and Wysocka, 2013). Using the major upstream SMAD2 peak at the Lefty1 locus as an example of an SBS that is neither acetylated in the absence of signaling nor nucleosome-depleted (Figure 5), we observed that H3K4Me1 is enriched prior to signal activation, and persisted with sustained NODAL/Activin signaling (Figure 6E). Thus, SMAD2 binding strength correlates with histone acetylation status, either in a constitutive or acute signal-induced manner and H3K4Me1 likely precedes SMAD2 binding and H3 acetylation. As SMAD2 cannot bind DNA itself, it requires additional TFs for recruitment to chromatin (Gaarenstroom and Hill, 2014). We therefore examined the sequences under the summits of the SMAD2 peaks in the high confidence dataset to identify binding sites for recruiting TFs. As expected we found sites for known SMAD2 co-factors, including FOXH1, POU5F1, and also the SMAD3/4 binding element, which reflects DNA binding of SMAD4 in the activated SMAD complex (Inman and Hill, 2002) (Figure 7—figure supplement 1A). Novel motifs were also found, as well as a weaker enrichment for the NANOG, EOMES and TEAD sites (Figure 7—figure supplement 1A and B). We confirmed the requirement of FOXH1 and POU5F1 for Activin-induced transcription for some representative target genes, which have at least one SMAD2 peak containing binding sites for these TFs (Figure 7A; Figure 7—figure supplement 2A). The effect of FOXH1/POU5F1 knockdown was gene-dependent. Lefty1 and Eomes required both FOXH1 and POU5F1, whilst Tdgf1 was dependent only on POU5F1, and Pmepa1 did not require either, consistent with the fact that it is induced by TGF-β in many different cell types (Levy and Hill, 2005; Watanabe et al., 2010). Similarly, we tested the requirement for NANOG, EOMES or TEAD on the transcription of target genes containing the relevant motif under their SMAD2 peaks. However, knockdown of these factors had no effect, suggesting that they may not be essential for Activin-induced transcription in these cells (data not shown). FOXH1 is required for SMAD2 recruitment and nucleosome remodeling at a subset of Activin target genes. (A) P19 cells were transfected with siRNAs directed against either Pou5f1 or Foxh1, along with a non-targeting control (NT). Following signal inhibition or Activin induction, qPCR was performed for the genes shown. Plotted are the means and SEM of three independent experiments performed in duplicate of gene expression values normalized to endogenous Gapdh values. (B) The position of FOXH1 or POU5F1 motifs (regardless of orientation or strand) was plotted relative to the summit of all the peaks used in Figure 7—figure supplement 1A. (C) ChIP-PCR for FOXH1 at the indicated SBSs and negative control (Neg ctrl) region using P19 cells in the conditions shown. Plotted are the means and SEM of two independent experiments performed in duplicate. (D–F) P19 cells were transfected with either non-targeting (NT) or Foxh1 siRNAs, which were then signal inhibited (SB-431542) or stimulated with Activin for 1 hr after SB-431542 washout. They were assayed for SMAD2 ChIP-PCR (D), H3K27Ac ChIP-PCR (E) or FAIRE-PCR (F) on the selected SBSs indicated. Plotted in D are the means and SEM of three independent experiments. Neg ctrl, negative control. The data in E and F are from a representative experiment of three (means ± SD). See Figure 7—figure supplement 4 for the averages of the three experiments and the statistical analyses. In A, C and D, n.s., not significant; **** corresponds to a p value of < 0.0001; *** corresponds to p value of < 0.001; ** corresponds to a p value of < 0.01. We noted that the FOXH1 motif is centrally enriched relative to the SMAD2 peak summit, compared with the POU5F1 motif, which is more evenly distributed (Figure 7B). 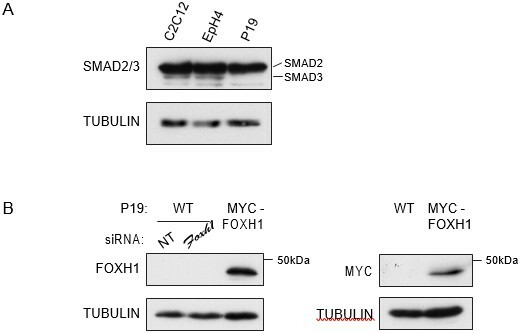 This suggested that these two TFs may play fundamentally different roles in SMAD2 binding, with FOXH1 directly recruiting SMAD2, whilst POU5F1 having a more auxillary role. Strikingly, SMAD2 binding strength correlated with the presence of a FOXH1 motif and the FOXH1 binding site was significantly enriched in SBSs bound by SMAD2 after 1 hr Activin stimulation, compared with 8 hr (Figure 7—figure supplement 1C,D). 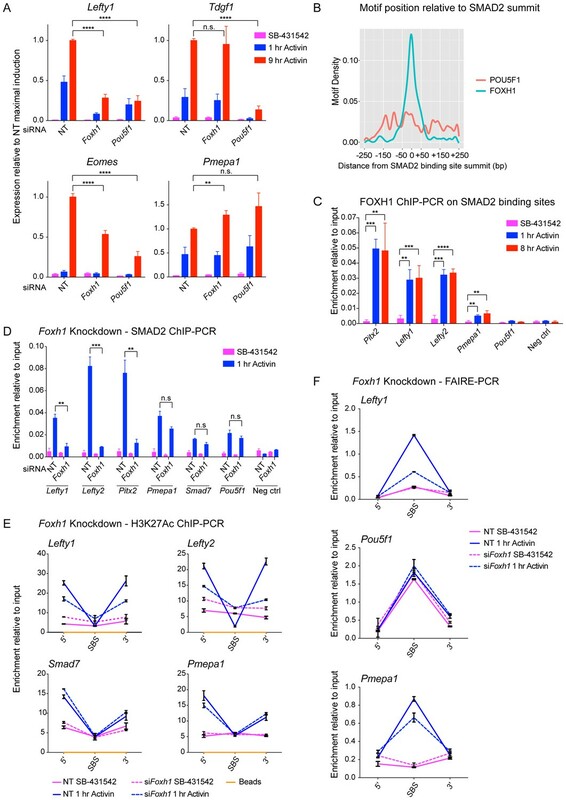 Since FOXH1 is a member of the forkhead transcription factor family which frequently act as pioneer factors (Zaret and Carroll, 2011), we hypothesized that FOXH1 may act as such to recruit SMAD2 to sites of closed unacetylated chromatin. We raised an antibody against mouse FOXH1 (Figure 7—figure supplement 3) and performed ChIP-PCR on a subset of SBSs. We found no binding of FOXH1 at all at any SBS in the SB-431542-treated cells, but binding was rapidly and strongly inducible upon Activin stimulation at the SBSs for Lefty1, Lefty2, and Pitx2, which are genes whose transcription is FOXH1-dependent (Figure 7C). There was little or no inducible binding at the SBSs flanking Pmepa1 and Pou5f1, as expected, since expression of these genes does not require FOXH1 (Figure 7C). The same results were obtained using a P19 cell line that stably expresses near-endogenous levels of MYC-tagged FOXH1 and performing ChIP-PCR with an anti-MYC antibody (Figure 7—figure supplement 2B–D). Thus for genes that are regulated by FOXH1, it is recruited to DNA together with SMAD2 upon Activin stimulation, and does not act as a classic pioneer factor. We next tested whether FOXH1 is directly required for SMAD2 binding to target loci and for the subsequent changes in chromatin landscape in response to signaling. Following knockdown of FOXH1, Activin-induced recruitment of SMAD2 was inhibited at SBSs around Lefty1, Lefty2 and Pitx2 (Figure 7D; Figure 7—figure supplement 2E), and Activin-induced H3K27 acetylation at the Lefty1 and Lefty2 sites was also perturbed (Figure 7E; Figure 7—figure supplement 2F; Figure 7—figure supplement 4). As expected, recruitment of SMAD2 and subsequent H3 acetylation at sites around genes shown not to be dependent on FOXH1 such as Tdgf1, Pmepa1, Pou5f1 and Smad7 was unaffected (Figure 7D,E; Figure 7—figure supplement 4). We also investigated whether FOXH1 is required for signal-dependent nucleosome displacement using FAIRE-PCR. Activin-induced chromatin accessibility of the Lefty1 SBS was substantially inhibited when FOXH1 was depleted (Figure 7F; Figure 7—figure supplement 4), indicating that the FOXH1–SMAD2 complex is required there for nucleosome eviction. FOXH1 was not required for ligand-induced accessibility of the Pmepa1 SBS, consistent with the lack of FOXH1 dependence for SMAD2 binding at this site or for Pmepa1 transcription (Figure 7F; Figure 7—figure supplement 4). The constitutively open Pou5f1 SBS was also unaffected by depletion of FOXH1, as expected (Figure 7F; Figure 7—figure supplement 4). FOXH1 is therefore responsible for directing SMAD2 to a subset of target sites in response to acute signaling. This in turn leads to nucleosome depletion and histone acetylation. FOXH1 does not act as a pioneer factor, but binds together with activated SMAD2. Having demonstrated that activated SMAD2 binds to closed chromatin and that it induces nucleosome eviction, we dissected the underlying mechanism. Previous work has shown that SMARCA4, the ATP-dependent helicase component of the SWI-SNF nucleosome remodeling complex (Lange et al., 2011), is required for TGF-β-induced transcription of many, though not all, target genes (Ross et al., 2006; Xi et al., 2008). At what level it functions has not been clear. As SMARCA4 is known to interact with activated SMAD2 (Ross et al., 2006; Xi et al., 2008), we hypothesized that it was a good candidate for promoting chromatin remodeling and/or nucleosome eviction at SMAD2 binding sites. To address this possibility we first tested the effect of SMARCA4 knockdown on transcription of a selection of Activin target genes. Activin-induced transcription of three ‘baseline off’ genes, Lefty1, Lefty2 and Pmepa1, was inhibited by depletion of SMARCA4, whilst the Activin-induced transcription of two ‘baseline on’ genes, Smad7 and Pitx2 was unaffected (Figure 8A). The effect of SMARCA4 depletion on SMAD2 chromatin binding correlated well with the transcription assays. 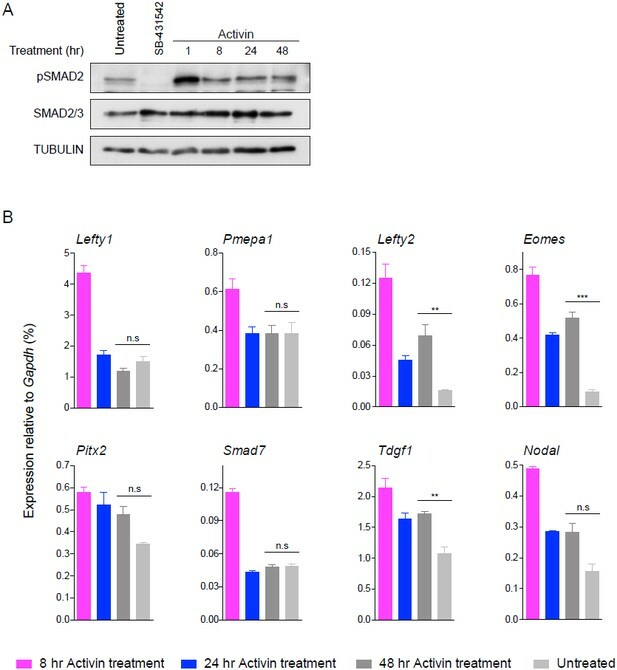 Recruitment of SMAD2 to the SBSs flanking Lefty1, Lefty2 and Pmepa1 required SMARCA4, but SMAD2 recruitment to those regulating Pitx2 and Smad7 was not substantially affected (Figure 8B). Consistent with the idea that SMAD2 binding leads to flanking histone acetylation and nucleosome eviction, we found that Activin-induced H3K27 acetylation and increased chromatin accessibility at the SBSs flanking Lefty1, Lefty2 and Pmepa1 were also dependent on SMARCA4 (Figure 8C,D; Figure 8—figure supplement 1). In contrast, Activin-induced acetylation and accessibility of the Smad7 and Pitx2 SBSs was markedly less dependent on SMARCA4 (Figure 8C,D; Figure 8—figure supplement 1). SMARCA4 is required for SMAD2 binding, nucleosome eviction and histone acetylation at a subset of Activin target genes. (A) P19 cells were transfected with either non-targeting (NT) or Smarca4 siRNAs. Cells were then signal inhibited (SB-431542) or stimulated with Activin for 1 hr after SB-431542 washout. They were assayed for transcription by qPCR. The data shown are means ± SEM from four independent experiments. (B–D). Samples were prepared as for A and assayed for SMAD2 ChIP-PCR (B), H3K27Ac ChIP-PCR (C), or FAIRE-PCR (D) on the selected SBSs indicated. Plotted in B are the means and SEM of four independent experiments. Neg ctrl, negative control. The data in C and D are from a representative experiment of three (means ± SD). See Figure 8—figure supplement 1 for the averages of the three experiments and the statistical analyses. In A and B, **** corresponds to a p value of < 0.0001. ** corresponds to a p value of < 0.01; n.s., not significant. We conclude therefore that SMARCA4 is required for SMAD2 binding to closed chromatin at ‘baseline off’ genes, where it mediates nucleosome eviction and flanking acetylation. By combining RNA-seq with ChIP-seq for SMAD2, two distinct forms of Pol II, histone H3 acetylations and total H3 in P19 embryonic carcinoma cells, we have addressed how a single pathway induces a program of gene expression that is constantly remodeled over time. Our work has determined the sequence of events that occur from SMAD2 recruitment to chromatin to transcriptional activation and establishes new paradigms for ligand-induced SMAD2-dependent transcription (Figure 9). A model of dynamic SMAD2-dependent transcription. The two modes of SMAD2 binding to either acetylated (green diamonds) nucleosome-depleted chromatin or closed, non-acetylated chromatin marked by H3K4Me1 (blue diamonds) upon Activin stimulation from the SB-431542 state are depicted. SMAD2 binds in conjunction with FOXH1 at some targets or with distinct TFs at others. Once bound, SMAD2-containing complexes locally increase H3K27Ac and H3K9Ac via recruitment of HATs, and can induce nucleosome displacement, which for ‘baseline off’ genes requires SMARCA4. Upon sustained signaling, SMAD2 may be recruited to new targets in a delayed manner or already-bound SMAD2 may recruit repressors to dampen or inhibit transcription at later time points. First, we have shown that activated SMAD2 exhibits two distinct modes of binding. For a subset of genes SMAD2 binds in response to acute Activin signaling to transcriptionally silent chromatin. These sites appear to be marked by H3K4Me1 and SMAD2 binds them without the requirement for a pioneer factor. In fact we show that SMAD2 and the co-activator FOXH1 both bind inducibly upon Activin signaling. SMAD2 binding induces nucleosome displacement and histone H3 acetylation at multiple sites at adjacent nucleosomes. The acetylation is likely induced by EP300 as we demonstrate that this HAT is recruited to chromatin with the same kinetics as SMAD2. Moreover, SMAD2 recruitment, histone acetylation and chromatin accessibility requires SMARCA4. At other targets, which have a detectable level of basal transcription, SMAD2 binds to pre-existing nucleosome-depleted sites that are already flanked by acetylated H3-containing nucleosomes. H3 acetylation is further increased upon SMAD2 binding at these sites. Following SMAD2 binding and induction of local histone acetylation, transcription is initiated by inducing Pol II recruitment, rather than via a pause–release mechanism commonly associated with signal-induced transcription. Pol II recruitment correlates with further histone acetylation both at the TSS and in the body of the regulated gene. Finally, we have established that the long-term dynamic transcriptional profiles downstream of NODAL/Activin require a continuous signaling input. This is evident at the level of chromatin since we find that SMAD2 remains bound at enhancers at prolonged times after Activin induction even though target gene transcription is frequently attenuated or completely terminated. Thus SMAD2 binding does not correlate directly with transcription of target genes, and our results strongly suggest that chromatin-bound SMAD2 sequentially recruits multiple co-factors that modulate the transcriptional output during prolonged signaling. We identified four distinct kinetic patterns of gene expression induced by Activin. Approximately a third of the target genes require protein synthesis for their correct induction/repression in response to signaling, demonstrating that the initial response is remodeled at later times by factors that are themselves encoded by Activin target genes. Furthermore, as the kinetic patterns of gene transcription require continuous Activin signaling, many of these factors likely collaborate with pSMAD2. 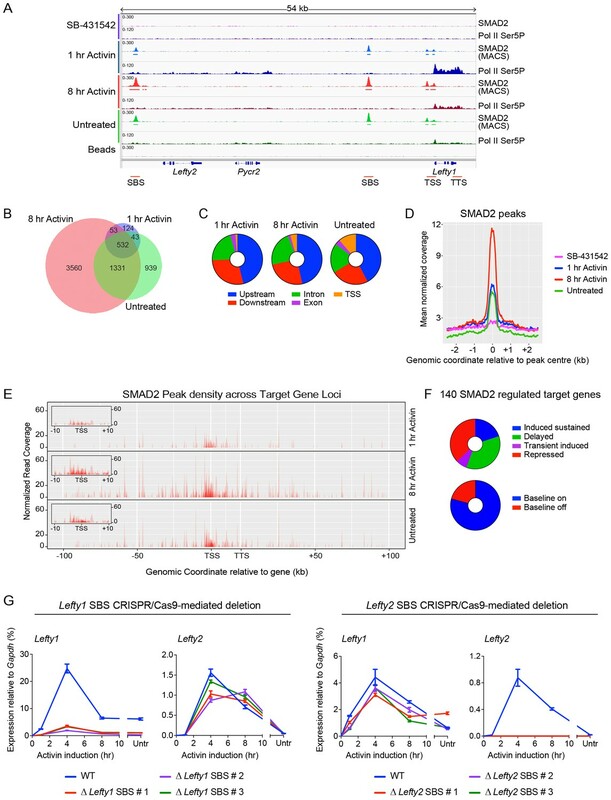 The increased numbers and/or intensity of SMAD2 peaks observed during prolonged signaling suggest that more SMAD2-containing complexes become stably associated with chromatin as a result of SMAD2-mediated transcription. In some cases the additional peaks occur at target genes already activated by SMAD2 and may reflect localized chromatin remodeling. In other cases, these delayed peaks occur at genes that are induced with delayed kinetics (for example Eomes and Trh) and may reflect newly synthesized co-factors recruiting SMAD2 to secondary target genes (Figure 9). There are many examples in the literature of SMAD complexes interacting with distinct TFs or switching their partner TFs during differentiation (Brown et al., 2011; Faial et al., 2015; Mullen et al., 2011). Our data further suggest that rather than transcription termination resulting from loss of SMAD complexes from enhancers, SMAD2 must recruit secondary repressors to either attenuate transcription (induced sustained genes), or return it to basal levels (transiently induced genes). This mechanism also seems to be true of some of the repressed genes, which are initially transiently activated in response to Activin, prior to their repression. We have not yet provided direct evidence for this secondary repression mechanism, but possible candidates for such repressors are TGIF, SKI, SKIL, ZEB1/2 or EVI-1 that can associate with activated SMAD2/3 to repress transcription (Deheuninck and Luo, 2009; Kurokawa et al., 1998; Postigo et al., 2003; Tsuneyoshi et al., 2012; Wotton et al., 1999). Thus, we conclude that a transcriptional network is established downstream of Activin stimulation that modulates the transcriptional response at later time points. During the course of this study we have compared the influence of ligand dose versus duration of signaling on the transcriptional response to NODAL/Activin signaling. Our data suggest that although some genes show a dose-dependent response, the major determinant of transcriptional output is signaling duration for the reasons outlined above. These results fit well with the observation that it is duration of NODAL signaling in zebrafish embryos, rather than amplitude, that determines cell fate specification (Hagos and Dougan, 2007; Schier, 2009). Tracking chromatin landscape changes over time at genes induced or repressed with different kinetics in response to Activin led us to the striking finding that at some loci SMAD2 binds to inactive chromatin. Its binding results in rapid nucleosome displacement and histone H3 acetylation on either side of the SMAD2-binding site. This subsequently leads to Pol II recruitment and acetylation at the TSS of the target gene with kinetics following the expression pattern of the transcript. The ability of activated SMAD2 to bind inactive chromatin and remodel it was unexpected, as it was previously suggested that SMAD2/3 only binds sites already occupied by master TFs, and that NODAL/Activin signaling does not affect nucleosome positioning at POU5F1-shared binding sites in ESCs (Mullen et al., 2011). We uncovered this alternative mode of SMAD2 binding because we investigated a timecourse of signaling from a signal-inhibited baseline, as opposed to focusing on constitutive signaling states. Nucleosome remodelers have been implicated in SMAD2-mediated transcription, with the SWI/SNF ATPase SMARCA4 being required for a subset of TGF-β responses in both P19 and human epithelial cells (Ross et al., 2006; Xi et al., 2008). BPTF is an ISWI nucleosome remodeler that also interacts with SMAD2/3 and mediates NODAL/Activin-induced visceral endoderm differentiation in early mouse embryos (Landry et al., 2008). However, until now it was unclear whether nucleosome remodeling was a prerequisite for SMAD2-containing complexes to find their target sites or a consequence of SMAD2-mediated transcription. We have shown that for ‘baseline off’ genes SMARCA4 is required for both SMAD2 binding and subsequent chromatin remodeling and nucleosome eviction. Interestingly SMARCA4 was not required at the Pitx2 SBS, even though it exhibits some of the same characteristics as the Lefty1 and Lefty2 SBSs (FOXH1-dependent and closed unacetylated chromatin at the SBS). This suggests that the chromatin remodelers involved in SMAD2 binding and nucleosome eviction are gene specific, and that additional factors are involved in their recruitment. Importantly, we found no evidence for a pioneer factor stably bound prior to SMAD2 recruitment at silent chromatin. In this respect these SBSs are analogous to so-called latent enhancers that are bound by stimulus-activated and lineage-determining TFs upon macrophage stimulation (Ostuni et al., 2013), and we will refer to them henceforth as such. Our data also suggest that the latent enhancers in P19 cells may be marked by H3K4 monomethylation, known to mark active and poised enhancers (Zentner et al., 2011). We demonstrated its presence at the Lefty1 enhancer both in the SB-431542 state and after acute and chronic Activin induction. It remains unclear, however, how this modification is established prior to TF binding. SMAD2 binding correlates with an acute induction of H3K27Ac and H3K9Ac either side of the SBS, suggesting that SMAD2 induces acetylation through recruitment of HATs. H3 acetylation is limited to one to two nucleosomes flanking the SMAD2 peak. SMADs have been shown to bind the HATs EP300, PCAF and GCN5 (Ross and Hill, 2008). We have demonstrated that EP300 is enriched together with SMAD2 at enhancer loci, and intriguingly, we previously showed that EP300 recruited to a chromatin template in vitro by DNA-tethered SMAD2 preferentially acetylates H3 over H4 (Ross et al., 2006). Overall we have observed that in response to acute Activin signaling, H3K9Ac and H3K27Ac are induced similarly. Although H3K27Ac is predominantly catalyzed by EP300 (Calo and Wysocka, 2013), H3K9Ac is thought to be catalyzed by GCN5/PCAF or TIP60 (Karmodiya et al., 2012). Thus activated SMAD2 likely recruits several distinct HAT complexes to mediate localized H3 acetylation. Using motif enrichment analysis and siRNA-mediated knockdown we have demonstrated that a subset of NODAL/Activin targets relies on FOXH1 and/or POU5F1. For a selection of latent enhancers (for example Lefty1, Lefty2, and Pitx2) FOXH1 recruits the active SMAD2-containing complex. FOXH1 is a member of the Forkhead family of TFs and one of the best characterized SMAD2 binding partners (Chen et al., 1996; Randall et al., 2002; Silvestri et al., 2008). We had hypothesized that FOXH1 would act as a pioneer factor. However, we found that FOXH1–SMAD2 complexes bind their target sites only in response to signaling, implying that they bind cooperatively. This mode of binding and the requirement for chromatin remodeling complexes suggests that SMAD2 may bind chromatin through what has recently been termed the dynamic assisted loading mechanism (Swinstead et al., 2016). At the latent enhancers, FOXH1 is required for Activin-induced SMAD2 recruitment, and hence for ligand-induced nucleosome displacement and histone acetylation. Importantly, FOXH1 is not the only SMAD2-recruiting TF that can bind to latent enhancers. Activin-induced accessibility of the upstream enhancer of the Pmepa1 gene does not require FOXH1 and must be dependent on an as yet unidentified TF. In addition to the latent enhancers, we found many examples of enhancers that were already nucleosome depleted and flanked by acetylated nucleosomes, such as the SBSs flanking Pou5f1 and Trh. In these cases, the genes exhibit a baseline of expression, indicating that a TF is already bound. POU5F1 itself is a good candidate for creating a favorable environment at these enhancers for SMAD2 to bind and potentiate transcription. Indeed, the fact that the POU5F1 canonical binding site is not centrally enriched under SMAD2 peaks argues for an indirect role for POU5F1 in SMAD2 recruitment. In conclusion, our study defines the sequence of events elicited directly by SMAD2 that occur on chromatin in response to signal activation. Our newly established paradigms highlight that there is no single generic mechanism of SMAD2-mediated transcription, but rather it is gene specific and can occur in an acute or delayed fashion and can be activatory or repressive. The initial transcriptional profile is modulated at later time points as a result of both delayed SMAD2 binding, and subsequent binding of repressors to already occupied SBSs. Future work will aim to identify TFs and enzymes that collaborate with the SMADS to modulate the transcriptional response over time, allowing cells to correctly execute gene expression programs in response to TGF-β superfamily signaling. P19 cells (Rudnicki and Mcburney, 1987) were obtained from Grace Gill (Harvard Medical School), C2C12 cells (Bains et al., 1984) were obtained from Richard Treisman (Francis Crick Institute) and EpH4 cells (Reichmann et al., 1989) were obtained from Harmut Beug (IMP, Vienna). All three cell lines were banked by the Francis Crick Institute Cell Services, were certified negative for mycoplasma and validated as of mouse origin. In each case their identity was authenticated by confirming that their responses to ligands and their phenotype was consistent with published history. All three cell lines were cultured in Dulbecco’s Modified Eagle Medium containing 10% FCS. 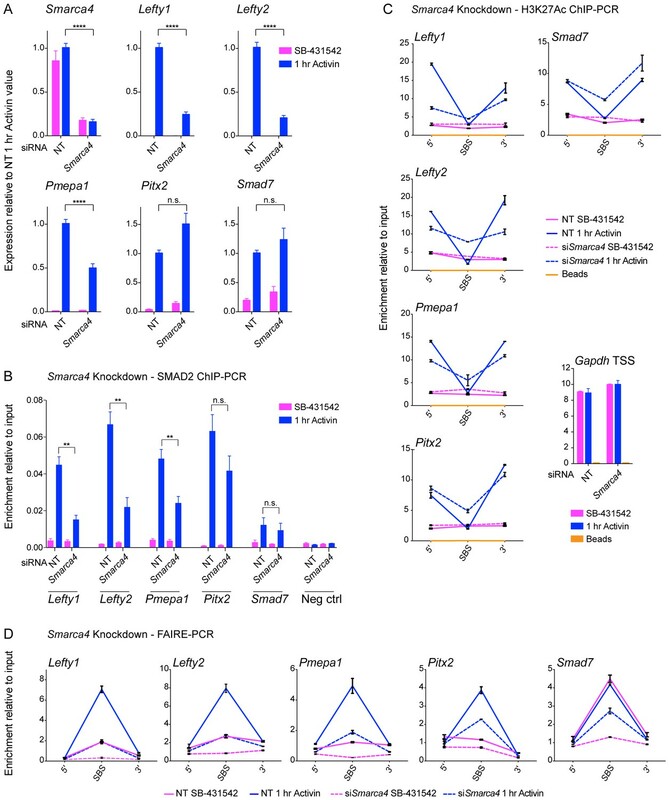 P19 cells stably expressing MYC-FOXH1 were generated via transfection with a plasmid encoding MYC-tagged FOXH1 (Labbé et al., 1998) and pSUPER-retro-puro (Grönroos et al., 2012), and selecting for puromycin-resistant stable clones. NODAL/Activin signaling was inhibited by overnight incubation with 10 μM SB-431542 (Tocris Bioscience, UK), which was washed out three times with PBS prior to stimulation with 20 ng/ml Activin (Peprotech, New Jersey, USA) in full media for different times. For the SB-431542 condition, after washout, cells were incubated for 1 hr in 10 µM SB-431542 in full media, providing a control for a possible transient effect of serum stimulation in the 1 hr Activin samples. The untreated condition represents a chronic signaling state as a result of autocrine production of NODAL and GDF3. For the SB-431542 chase experiment, cells were treated as described above in the control samples, or 10 μM SB-431542 were added to the cells after 1 hr of Activin treatment for different times. Cycloheximide and emetine (Sigma, UK) were used at 5 µg/ml and 10 μM respectively. Actinomycin D (Sigma) was used at 6 μM and curve fitting of the experimental data was performed using the one phase decay function of Prism 6 software, with least squares fit as the fitting method. siRNA transfections were carried out using Lipofectamine RNAiMAX (Thermo Fisher Scientific, Massachusetts, USA) for 72 hr (48 hr for Pou5f1) at a final concentration of 20 nM. siRNAs were from Dharmacon (Colorado, USA) and are listed in Supplementary file 3. Total RNA was extracted using Trizol (Thermo Fisher Scientific) according to the manufacturer’s instructions. cDNA synthesis and qPCRs were performed as described (Grönroos et al., 2012). Primer sequences are listed in Supplementary file 3. Total cell lysates were generated as described (Germain et al., 2000), and Western blotted using the antibodies listed in Supplementary file 3. Western blots were imaged and quantified using an ImageQuant 4000 mini and ImageQuant TL 8.1 software (GE Healthcare, UK). A peptide corresponding to amino acids 16–31 of mouse FOXH1 was used to generate rabbit antisera against FOXH1. The antibody was affinity purified using a column of SulfoLinkTM resin coupled to the peptide according to the manufacturer’s instructions (Thermo Scientific, cat # 44999). We validated the antibody in several different ways. We proved that it recognised Myc-FOXH1 in a stably overexpressing P19 cell line by Western blot (Figure 7—figure supplement 3). Moreover, we compared its activity in a ChIP-PCR on wild-type P19 cells with that of a Myc antibody in the P19 cell line that expresses Myc-FOXH1 at approximately endogenous levels and found the results to be equivalent. To avoid problems of heterogeneity in the P19 population, we first isolated a clone of P19 cells that had the same characteristics as the P19 pool with respect to gene expression profiles and pSMAD2 induction patterns in response to Activin treatment. DNA oligos corresponding to the sgRNA sequences (see Supplementary file 3) were cloned into pSpCas9(BB)−2A-GFP (PX458) (Ran et al., 2013), and the plasmids were transfected into P19 cells using Lipofectamine 2000 (Invitrogen, California, USA) according to the manufacturer’s instructions. 48 hr after transfection, the GFP-positive cells were FACS-sorted into 96 well plates. Resulting single cell clones were screened by PCR using primers flanking the guide sites (Supplementary file 3). The PCR fragments of positive clones were sequenced to identify the CRISPR/Cas9-mediated deletions. Cells were crosslinked using 1% formaldehyde for 10 min at room temperature, followed by lysis in 5 mM HEPES (pH 8), 85 mM KCl, 0.5% NP-40. After centrifugation, nuclei were washed in 5 mM HEPES (pH 8), 85 mM KCl and then sonicated to 100–400 bp using 8–12 30” on-off cycles in 50 mM Tris-HCl (pH 8), 10 mM EDTA, 1% SDS using a Bioruptor Sonicator (Diagenode, Belgium). The resulting chromatin was diluted 5x, pre-cleared with protein A/G Dynabeads (Invitrogen) and then incubated overnight with antibodies in immunoprecipitation (IP) buffer (50 mM HEPES (pH 7.5), 1% Triton X-100, 150 mM NaCl). Protein A or G Dynabeads (100 µl) blocked with BSA were then added for 6 hr, followed by six washes in IP buffer containing 0.1% sodium deoxycholate, 0.1% SDS and 1 mM EDTA, with the last three additionally containing 500 mM NaCl. A wash was then performed with 10 mM Tris-HCl pH 8, 250 mM LiCl, 1 mM EDTA, 1% NP-40 and 0.5% sodium deoxycholate followed by a final wash in 10 mM Tris-HCl pH 8, 1 mM EDTA. Chromatin was eluted in 1% SDS, 0.1 M NaHCO3. De-crosslinking and Proteinase K digestion was carried out at 65°C overnight. The resulting enriched chromatin was cleaned up using a QiaQuick PCR purification kit (Qiagen, Germany) according to the manufacturer’s instructions. qPCR was carried out as for gene expression analysis, with a standard curve consisting of 6 points and three-fold dilutions. Values for each IP sample were normalized relative to corresponding input chromatin for the same treatment. Primer sequences and antibodies are listed in Supplementary file 3. Samples for FAIRE-PCR were crosslinked, lysed and sonicated as for ChIP, followed by FAIRE as described (Simon et al., 2012). All RNA-seq experiments were performed as biological duplicates. Where the RNA-seq was performed in the presence of protein synthesis inhibitors, cycloheximide or emetine were added after the PBS washout, 5 min before the addition of Activin or SB-431542. Total RNA was prepared using Trizol followed by a clean up with an RNeasy kit (Qiagen). The quality of the RNA was assessed using a Bioanalyzer (Agilent, California, USA). Libraries were prepared using the TruSeq Stranded mRNA Sample Prep Kit (Illumina, California, USA). 101 bp single end reads were generated using an Illumina HiSeq 2500. Read quality was assessed with FastQC (Patel and Jain, 2012). Quality score distributions across the reads were within acceptable limits with the majority of the reads having a Phred score above 30. There was no observable position-specific base bias within the reads. Read duplication levels were within the limits of what would be expected for RNA-seq, with the majority of reads being unique. There were no over-represented sequences. The 101 bp single-end read data were aligned to the mm10 version of the mouse genome using TopHat2 (Kim et al., 2013). A transcriptome guide file derived from the knownGene annotation table available from the University of California, Santa Cruz (UCSC) Genome Bioinformatics site was provided to focus alignments towards characterized transcripts. Non-unique alignments were removed prior to further analysis. The data were quantified at the gene level by counting reads aligning within each gene's exon structure. Reads partially aligning outside exon boundaries were excluded from the quantification using the summarizeOverlaps function from the GenomicAlignments Bioconductor library with mode=‘IntersectionStrict’ (Huber et al., 2015). The mean RNA-seq gene alignment rate was 26.5 million reads. Genes with low read counts are susceptible to sampling error and as a consequence their counts can be unreliable. We therefore removed genes with a mean count across all samples below the 40th percentile of counts across all genes and all samples. This effectively removes the non-expressed and lowly expressed genes prior to statistical analysis. We accounted for differences in total read counts observed between the different samples using the normalization strategy found in the DESeq package from Bioconductor (Anders and Huber, 2010). This approach is equivalent to scaling to the total number of reads, however it is biased towards non-differential genes. This approach helps to negate instances where a small number of highly expressed and differential genes can have a strong effect on the total read count. To determine differentially-expressed genes we used a negative binomial distribution implemented in DESeq to model the data. We ran pairwise comparisons of each time point against the SB-431542 sample to determine time point-specific differential expression, and identified differentially-expressed genes using an FDR threshold of 0.05 and a log2FC filter of 0.7. We further manually filtered this list by discarding genes with <30 reads across all treatment conditions, as these likely represent background noise. We also removed genes only showing a significant change in the ‘Untreated’ condition, which might be due to long-term serum depletion of that sample compared to the others. This gave a total of 747 differentially-regulated genes. To cluster the genes according to their kinetic expression patterns, the following rules were used. Induced sustained: 1 hr Activin log2FC ≥0.7; 8 hr Activin log2FC >1 hr Activin log2FC; Untreated log2FC ≥0. Delayed: 1 hr Activin log2FC ≤0.7; 8 hr Activin log2FC ≥0.7; Untreated log2FC >0. Repressed: 8 hr Activin log2FC ≤0.7; Untreated log2FC ≤0. In all cases, the log2FC was relative to the SB-431542 sample. For classification between ‘baseline on’ and ‘baseline off’, a gene was designated as ‘baseline off’ if less than 30 reads were detected in the SB-431542 sample. For classification as direct or indirect, a gene was defined as indirect if in both the cycloheximide- and emetine-treated 8 hr sample the log2FC did not reach >0.5 (for induced sustained and delayed genes) or < −0.5 (for repressed genes), or if 8 hr Activin log2FC >1 hr Activin log2FC (for transient induced genes). Samples for ChIP-seq with the corresponding inputs were prepared as described above for ChIP-PCR. Following end repair, poly-A-tailing and adapter ligation, Illumina TruSeq ChIP sample preparation kits were used to generate the libraries. The Illumina kit Phusion enzyme was replaced by Kapa HiFi HotStart ready mix (Kapa Biosystems, Cape Town, South Africa). The PCR was run before gel isolation using the Invitrogen SizeSelect E-gel system (SizeSelect gel protocol, Thermo Fisher Scientific). Post PCR we used AMPure XP beads (AMPure bead protocol, Beckman Coulter, Inc.) at a 1:1 ratio to maintain size integrity. Samples were multiplexed and 51 bp single end reads were generated on an Illumina HiSeq 2500. The raw reads were aligned to the mouse mm10 genome assembly using BWA 0.6.2-r126 (Li and Durbin, 2009), with a maximum mismatch threshold of 2 permissible within a seed length of 51 bp. All other parameters were kept as default. For the Pol II and histone ChIP-seq datasets the alignments were post-processed with picard-tools 1.107 for the removal of reads that could have arisen from PCR duplication (http://sourceforge.net/projects/picard/). All ChIP-seq experiments were performed as biological duplicates. To identify regions enriched with reads when compared to an input control we used MACS (Zhang et al., 2008) (q-value 0.05). Peaks were annotated in terms of distance to nearest gene (user-defined) using ChIPPeakAnno (Bioconductor) (Zhu et al., 2010). We associated SMAD2-binding loci to the closest differential gene as determined by our RNA-seq and ChIP-seq for Pol II Ser5 data (max distance 100 kb from TSS/TTS). To quantify our SMAD2 binding sites we scaled the total number of mapped reads per sample to 40 × 106 and counted reads mapping to SMAD2 binding loci. To quantify gene-associated SMAD2 activity across the four time points we constructed a set of consensus binding sites by collapsing all binding sites identified from all comparisons. Binding loci were merged if they shared an overlap of at least a single nucleotide. Note that in our dataset the mean length of overlap between two MACS peaks was 200 bp, showing that the majority of the peaks have a ‘sizeable’ overlap. We quantified gene-associated SMAD2 activity by summing the normalized read counts across consensus loci that were associated with an individual regulated gene (SMAD2 footprint). Duplicate reads were removed prior to consensus peak quantification and reads were shifted to account for the fragment effect present in sequencing data. To select a list of SMAD2 peaks to take forward, we filtered out those peaks with low MACS fold enrichment scores (<3.0). Furthermore, we determined whether a peak contained sequences derived from repetitive elements by determining overlap with repeats reported in the repeatmasker track, UCSC Genome Browser. Peaks mapping to highly conserved repetitive sequence were removed. Accounting for variations in the sampling of the underlying sequence library caused by differences in the total number of reads sequenced is not straightforward for ChIP samples. Using total mapped reads has been shown to be unreliable, since variations in enrichment efficiency can have dramatic effects on the proportion of reads attributed to signal. A more appropriate normalization strategy is to use only reads derived from regions with high signal and low variance across all samples. Therefore, we used DiffReps 1.55.4 (Shen et al., 2013) to calculate sample-specific normalization factors for the Pol II (either phosphorylated on Ser2 or Ser5 of the CTD), H3K27Ac and H3K9Ac ChIP-seq datasets. Furthermore, to be able to compare the signal for the same protein or modification from different treatments, the DiffReps normalization factors generated per time point were adjusted so that the geometric mean of the SB-431542 samples was constant across all comparisons from the same IP. We also used DiffReps to determine sites of differential enrichment of Pol II (either phosphorylated on Ser2 or Ser5 of the CTD) at each time point relative to SB-431542. For each ChIP-seq experiment, replicate samples for each time point were compared to the SB-431542 sample. The corresponding input samples were also processed with DiffReps for background noise estimation. The ‘--nsd’ and ‘--frag’ parameters were set to ‘broad’ and ‘200’, respectively, and all other parameters were kept as default. Sites of differential binding for Pol II Ser2P and Ser5P from all the comparisons were overlapped with respect to knownGene gene loci from the UCSC with the allowance for 2 kb of flanking sequence. More specifically, for each comparison, the sum of all differential bases found to overlap a given gene was calculated, and this was reported as a ratio of the length of the gene interval. Through inspection of the dataset it was found that genes exhibiting an overlap ratio ≥0.09 in any one of the comparisons were the most reliable. This gene list was then manually filtered to remove microRNAs and false positives, giving a dataset of 410 genes. This dataset represents the annotated genes which clearly show differential Pol II occupancy in response to signaling. Genes differentially expressed according to RNA-seq, as well as genes found to contain differential Pol II occupancy at any time point, were taken forward as SMAD2 target genes. Overlapping genes between these two lists were selected. Outliers on either side were additionally included based on the presence of SMAD2 peaks conserved between the two biological ChIP-seq replicates within 100 kb of an annotated TSS or TTS. Moreover, genes that had differential Pol II binding, but did not pass the stringent filter used for the RNA-seq data, were included if they were found to be differentially expressed according to less stringently filtered RNA-seq analysis and by manual inspection of the data. This led to a final list of 140 genes, associated with 478 SMAD2 consensus peaks. Histone modification changes or Pol II enrichment across the time points for specific peak and gene sets were visualized using metaprofiles. In all cases the reads for the two biological replicates were added together to generate more read depth. The read depth vectors for loci across SMAD2 binding sites (the average MACS-called summit for each consensus peak) and SMAD2 target gene TSS loci were obtained. These vectors were then adjusted using the normalization factors generated by DiffReps described above, and metaprofiles were constructed by averaging per-nucleotide read depths across contributing loci. The metaprofiles were smoothened using local polynomials. In the case of TSS-centric profiles, genes in a reverse orientation were accounted for, and all plots run from 5' to 3'. To determine the similarity between the histone modifications at SMAD2 binding sites across the time points we clustered the DiffReps-normalized read count data. The normalized read count profiles were summed to give a single value per locus per sample (±2.5 kb relative to the TSS). We employed hierarchical clustering using euclidean distance to group the regions. To quantify the log2FC of Pol II (either Ser5P or Ser2P), the total numbers of reads mapping to the entire genomic extent of a gene (±2 kb) was determined, adjusting the counts from each sample by its DiffReps normalization factor. The mean values of these counts across the replicates was taken and compared to the mean normalized replicate value of the relevant SB-431542 sample. Hierarchical clustering was employed using euclidean distance. A similar analysis was performed with the H3K9Ac and H3K27Ac datasets focusing on either the TSS ± 2.5 kb or the SMAD2 binding sites. From the analysis of histone modifications at SMAD2 binding sites described above, we defined regions of high or low acetylation for H3K9 and H3K27 by selecting the nodes obtained via hierarchical clustering that show either high or low H3K9Ac/H3K27Ac (see Figure 6A). Taking the overlap between the H3K9Ac and H3K27Ac datasets, we defined 72 ‘low acetylation’ SMAD2 peaks and 44 ‘high acetylation’ SMAD2 peaks. To define peaks with low or high acetylation in the SB-431542 sample, the 100 most or least enriched acetylated peak regions in this sample were selected for each modification and the intersection of peaks selected. This resulted in 60 ‘low H3Ac SB baseline’ and 63 ‘high H3Ac SB baseline’ peaks. To define the low acetylation peaks in the SB-431542 sample segregated according to whether they remained lowly acetylated upon Activin induction or were increased, we selected the 120 peaks for which acetylation is low for both modifications in the SB-431542 state. These were divided into 62 peaks that show a ‘high increase’ and 58 that show ‘no increase’ in response to signaling, using a log2FC of ≥0.7 cutoff for both acetylation states in the 8 hr Activin sample relative to the SB-431542 sample. The ChIP-seq and RNA-seq data have been submitted to the NCBI Gene Expression Omnibus (GEO) under the accession number GSE77488. For visualization of ChIP-seq data using the IGV browser, Pol II and histone acetylation tracks are shown normalized using the DiffReps-generated factors, read extension by 100 bp and smoothing over 10 bp windows, while the SMAD2 tracks have been extended and smoothened. The H3 tracks represent the raw coverage obtained from the aligned reads. Metacore was used to identify enriched gene ontology signaling pathways, molecular function and biological processes within the SMAD2 target gene list. Default settings were used and also background lists provided by the program itself. Taking all 478 consensus peaks associated with a SMAD2 target gene, the MACS-defined summits from each contributing MACS-called peak were selected (757 in total). The 500 bp sequence surrounding each summit was extracted and submitted for known and de novo motif discovery using the MEME-ChIP suite. Default settings were used with the exception of MEME (site distribution – any number of occurrences; total number – 20). To search for specific occurrence and location of user-defined motifs within this dataset, Fuzznuc was used (Rice et al., 2000). Motif strings were designed based on published binding sites found in the Genomatix, Uniprobe, Jaspar and Motifmap databases. Three background datasets were used for comparison. (1) SMAD2 peak sequences were shuffled in a tri-nucleotide manner. (2) Searches were carried out on 5000 enhancer peak summits (300 bp each) as obtained from the ENCODE database for MAFK, ZC3H11A, HCFC and ZNF384 in mESCs. (3) Sequences were extracted from the mouse genome (9993 sequences, 500 bp in length), matched for distance from any SMAD2-regulated target gene at 8 hr Activin signaling, but in this case using genes which did not change their expression in response to the pathway. Experiments were performed at least twice independently (biological duplicates) and the majority were performed at least three times. Within each qPCR experiment, technical duplicates were run. Statistical analyses were performed using an unpaired t-test unless otherwise specified. p<0.01 was considered statistically significant. Molecular and Cellular Endocrinology 180:3–11. Molecular and Cellular Biology 4:1449–1453. Seminars in Cell & Developmental Biology 32:107–118. Journal of Biological Chemistry 277:51008–51016. Molecular and Cellular Biology 25:8108–8125. Current Opinion in Genetics & Development 21:726–731. The Journal of Cell Biology 108:1127–1138. The International Journal of Biochemistry & Cell Biology 40:383–408. Cell culture methods and induction of differentiation of embryonal carcinoma cell lines, Teratocarcinoma and Embryonic Stem Cells: A Pratical Approach, Oxford/Washington DC, IRL Press. Journal of Biological Chemistry 283:1146–1155. Journal of Biological Chemistry 274:703–709. Thank you for submitting your work entitled "Distinct modes of SMAD2 chromatin binding and remodeling shape the transcriptional response to NODAL/Activin signaling" for consideration by eLife. Your article has been evaluated by Jessica Tyler as the Senior Editor and three reviewers, one of whom is a member of our Board of Reviewing Editors. The reviewers have opted to remain anonymous. This study was designed to examine the SMAD2 genomic response in P19 embryonic teratoma cells treated with activin. The study is thorough and includes a variety of genome-wide methods, including RNA-seq and ChIP-seq. Together, the experiments reported provide a very useful data resource. This represents a major strength of the manuscript. However, the broad scope of the data presented did not lead to sufficient focus on conclusions that provide new insight into mechanisms of Smad2 signaling (see appended reviews, below). The consensus opinion of the reviewers is that the manuscript needs to be re-organized to highlight data that supports new conclusions and that additional experimental analysis may be needed to fully establish such conclusions. This opinion led to the decision to return the manuscript to you at this time. This study was designed to examine the SMAD2 genomic response in P19 embryonic teratoma cells treated with activin. The study is thorough and includes a variety of genome-wide methods, including RNA-seq and ChIP-seq. Together, the experiments reported provide a very useful data resource. This represents a major strength of the manuscript. 1) Recruitment of SMAD2 to both open and closed regions of chromatin is detected. This is argued to be incompatible with a model of SMAD2 recruitment to pioneer transcription factors (PMID: 22036565 & PMID: 22036566), but for this function, pre-binding is not essential. Indeed, it has been previously reported that FOXH1 is recruited to chromatin following activin signaling (PMID: 21741376). Moreover, a mechanism for activin-stimulated recruitment of FoxH1 to closed chromatin has been reported to be mediated by TIF1g-Smad2/3 (PMID: 22196728). It is unclear that the present study extends these previous findings. 2) SMARCA4 contributes to SMAD2 function at some sites. As noted by the authors, this has been noted elsewhere (PMID: 16990801 & PMID: 18003620). 3) The authors report (subsection “SMAD2 induces changes in the chromatin landscape to regulate transcription”, second paragraph; data not shown) that no significant enrichments of H3K27Me3 or H3K9Me3 were detected near mad binding sites. This finding contrasts with PMID: 25805847 (for at least some activin-dependent genes), but there is no follow up on this observation. On balance, this is a good study that provides an outstanding data resource that will be useful to researchers in the field of action/nodal signaling. However, enthusiasm for this study is dampened by the limited novelty of the major conclusions drawn by the authors. In this paper, the authors use several genome-wide approaches to investigate the mechanisms employed by Smad transcription factors to control transient gene expression profiles. A lot of data is generated and presented in this paper and from this the authors attempt to make several conclusions. However, overall, despite the large amount of work, the study lacks fundamentally new findings on how Smad transcription factors work. For example, the authors claim that Smad2 works through affecting polymerase recruitment and not pause release but the data are not entirely consistent with this view (see below). The authors also indicate that Smad binding kinetics do not necessarily correlate with gene expression profiles (and hence use different mechanisms at different genes). However, the authors do not take into account message stability, which is potentially reshaping the target gene expression profiles rather than a transcriptional effect per se. Another important issue is the inclusion of "media only" effects in timecourses of activin signalling and this is not really appropriate (see below) and impacts on the interpretation of the gene expression profiles. Two of the latter findings (i.e. involvement of FOXH1 and SMARCCA4) are interesting but are already well known and studied Smad effector proteins. Overall, the current paper is therefore not conclusive enough for publication, in part through the inclusion of too much information that is not always necessary. However, with streamlining and careful re-interpretation of the data, a more coherent story might emerge. 1) The inclusion of the "untreated" samples in parts B and C is not entirely valid. This is not the same as treating with activin for 48 hrs and is actually a different question being asked i.e. what is the difference between acute activin signalling responses and endogenously generated sustained signalling. This of course impacts greatly on the profiles in part C, where the last time point should be deleted. The "sustained" signal is not actually central to the story and could easily be deleted from the paper. Indeed, many of the later figures do not use this condition anyway. 2) Have the authors considered whether RNA stability is shaping the profiles in Figure 1C? This could explain the difference between "induced sustained" versus "transient induced". If the authors look at the RNA polymerase profiles (as should report on transcription) across the same gene clusters, do they see the same effects? 3) In many places, the authors include "representative experiments" rather than biological replicates. As "representative" implies replicates have been done, then why are they not included? Can the authors explain their rationale for doing this? For timecourse experiments, this can be acceptable due to adjacent timepoints acting as replicates (e.g. Figure 2G) but for other experiments this is less clear. For example, Figure 1—figure supplement 2C should contain averages of the replicate experiments as this is a simple knockdown experiment. The same applies elsewhere and should be justified. 4) It is not clear how the replicate ChIP-seq experiments were processed to get the final list of Smad targets. How reproducible were the two ChIP-seq experiments? 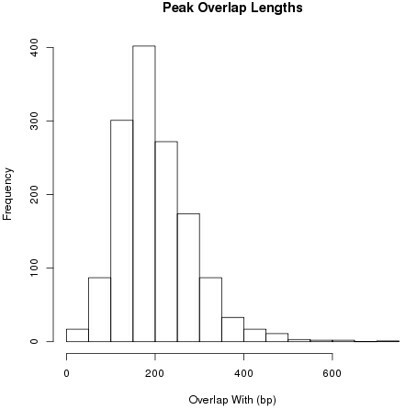 Also in generating "gene associated Smad activity" it is not clear why the authors took a "1bp" overlap in peaks. If looking at the same peak, then this is not stringent enough as the summits could be up to 500 bp apart and a parameter like summit-summit distance or% peak overlap should be used instead. If attempting to just associated total Smad binding with a gene, then the peak overlaps are not relevant. What happens if alternative ways of merging the Smad signal are used? 5) Figure 3D is central to the authors' conclusions about whether pause-release is occurring or not. However, in the "baseline on" set, there is clear evidence of paused polymerase in the inhibited condition i.e. at the TSS. In contrast this is not the case in the "baseline off" samples. In the latter case, then "recruitment" must be the primary mechanism and in the former case, pause-release must be the initial event. After the initial events it is highly likely that both mechanisms are important in both cases (i.e. the polymerase must be recruited and move to the elongation phase at both types of site once the first polymerase has moved off). It is also apparent in Figure 3B that both Ser2 and Ser5 forms of the polymerase increase which again suggests both mechanisms are generally activated. Have the authors looked at total RNA polymerase levels by ChIP rather than the CTD marks which inevitably pick out the promoter-proximal and elongating polymerases. 6) Another issue arises from Figure 3D as it is clear that the "repressed" genes are actually transiently activated which is actually apparent from the RNAseq data. Interestingly these genes show a lot of evidence for paused polymerase at the TSS. Perhaps more importantly, looking back on Figure 1C, all of the genes show increased activation at the 1 hr time point. This suggests a unifying mechanism of Smad action through upregulating the initial transcription levels. The authors invoke a mechanism of Smads recruiting additional co-repressors to then shape subsequent responses and there is no evidence presented to support this claim (and evidence should be provided for this claim to be made). 7) The authors claim that Smad has two modes of binding. One to open chromatin and one to closed chromatin. FAIRE data is provided to support this claim in a locus-specific manner (did the authors look genome-wide and what was the result?). Also, the authors plot H3 density across Smad binding regions. However, in Figure 5B there is very little change in H3 occupancy around the centre of the Smad binding region. Even in the "baseline off samples" (<30 regions), then the chromatin is still open at the Smad binding regions. Therefore, it appears that there is a window of accessibility already present to which Smad2 binds, and subsequently widens. Thus, the idea that Smad2 is binding differently is not really supported by the data but is in fact accessing a "nucleosome depleted" DNA region in all cases. 8) Related to point 7, the authors indicated that FOXH1 is not "pioneering" as binds at the same time as Smad2. However, if they are binding in the same complex, could FOXH1 still not be "pioneering in that context" i.e. the one that would access the closed chromatin? 9) In the text, it is stated that H3K9Ac and K27ac show the same patterns. However, they are clearly different in Figure 5B. i.e. H3K9Ac is transiently induced at 1hr at all sites whereas H3K27Ac is sustainably induced. The former correlates with initial Smad binding and the initial induction of gene expression and suggests could be the critical event controlled by Smad2. It is not clear why the authors have not commented more on this or developed this line of investigation. 10) It was not clear whether the selected genes in Figures 7 and 8 are in the "baseline off" category as they should be if testing chromatin accessibility issues. 11) It is essential that biological replicates are included in Figure 8B-D. At the moment for example it is difficult to conclude much from Figure 8B, as SMad2 enrichment goes down irrespective of the gene (i.e. not as stated in the text). Statistical significance (or not) would help clarify this. The effect of SMARCA4 is not clearcut. In part D for example, the FAIRE signal changes at Pitx2 and Smad7 show similar changes despite different baselines. The interpretation of this data could be that SMARCA4 is important for maintaining open chromatin whether inducible by Smad2 or not (i.e. important for all open chromatin). In the present study, the authors examined the role of Smad2 in activin/nodal signaling-induced gene expression in P19 embryonic teratoma cells. I understand that the authors made great efforts to finish this paper. They provide many interesting observations including multiple modes of Smad2 binding to chromatin and the involvement of SMARCA4 in expression of a subset of Smad2 target genes. I think that the paper significantly contributes to further understanding of the Smad signaling pathway. However, I have a few concerns as follows. 1) Activin/nodal signaling induces phosphorylation of Smad2 and Smad3 (as described in the third paragraph of the Introduction of this paper). However, the authors analyzed binding of Smad2 to chromatin but not that of Smad3. Is it appropriate to discuss activin/nodal signaling only referring Smad2? They should explain in the main text why they omitted arguments about Smad3. Other ChIP-seq papers on activin/nodal signaling analyzed both Smad2 and Smad3. 2) To conclude that Smad2 regulates target gene expression through de novo recruitment of pol II (subsection “SMAD2 regulates Pol II via recruitment”, last sentence), the authors should directly show that knockdown of Smad2 results in failure of pol II to be enriched around the TSSs of target genes. I am afraid that Smad3 may also be involved. Same to the description in the fourth paragraph of the subsection “SMAD2 induces changes in the chromatin landscape to regulate transcription”. 3) How did the authors validate specificity of the anti-FoxH1 antibody prepared by themselves? We were pleased to see that the reviewer recognized a strength of the paper as an outstanding data resource. We have now performed a large number of new experiments and analyses to corroborate the data and strengthen our new mechanistic insights into SMAD2 signalling. We have also rewritten the manuscript to better communicate the novelty of the major conclusions. The point of the study, which I think didn’t come over sufficiently strongly in the original version, was to answer fundamental questions about how transcription factor binding regulates transcription. Over the last decade a huge effort has been put into genome-wide mapping of transcription factor binding sites, histone modifications and chromatin accessibility. However, it is still unclear whether transcription factor occupancy induces histone modifications, or if the chromatin landscape dictates recruitment. Furthermore, much of this mapping has been carried out in steady state conditions. As a result, we know little about the sequence of events that occur from transcription factor binding to RNA Polymerase II regulation, or about how transcription factor binding influences the temporal patterns of gene expression in the longer term. The best way to study these critical issues is to use a system where the transcription factor binds in response to extracellular signalling, and to do this we have chosen to focus on Activin/NODAL signalling. In this paper for the first time we have delineated the sequence of events that occur from SMAD2 binding to transcriptional activation, and the mechanisms underlying them. Crucially, our work establishes new paradigms for signal-dependent transcriptional regulation. 1) We have provided unequivocal evidence that transcription factor binding causes histone modification and chromatin remodelling with the discovery that SMAD2 binds to closed chromatin and remodels it. This conclusion has now been strengthened with inclusion of additional metaprofiles (revised Figure 5) and additional ChIP-PCRs showing unequivocally that binding of SMAD2 to the Lefty1 and Pmepa1 SBSs results in nucleosome eviction (revised Figure 5—figure supplement 1). This discovery also overturns the dogma in the field resulting from the Young and Zon papers (PMIDs 22036565 and 22036566, see below) that SMADs act passively and only bind to ‘preconditioned’ chromatin. 2) We demonstrate that SMAD2 regulates RNA Polymerase II via de novorecruitment to target promoters. We have considerably strengthened this conclusion in the revised manuscript by analysing metaprofiles of Pol II Ser2P (see revised Figure 3D). 3) We demonstrate that SMAD2 chromatin binding does not directly correlate with transcription of target genes, and thus have overturned the assumption in the field that transcription factor binding linearly equates with transcriptional kinetics. We have now explored this latter issue in much more detail with an SB-431542 chase experiment (see Figure 1 and Figure 1—figure supplement 4). The results indicate that modulation of long-term responses to NODAL/Activin signalling requires on-going signalling. This provides a functional explanation for our observation that SMAD2 remains bound at regulatory regions of genes as their transcriptional profiles are modulated over time. It also supplies the previously missing crucial evidence that the underlying mechanism is via SMAD2 sequentially recruiting multiple regulators to chromatin. The reviewer argues that the two papers from the Young and Zon labs (PMID: 22036565 & PMID: 22036566), which conclude that master transcription factors (TFs) dictate cell type-specific responses to TGF-β/BMP signalling, could in fact be consistent with our finding that SMAD2 exhibits the two distinct modes of chromatin binding. It is true that in principle, the activated SMADs could bind DNA simultaneously with the master TFs, but neither of these papers actually addressed this issue. They did not investigate whether the co-occupancy of SMADs with master TFs was a result of pre- binding of the master TF, or whether the SMADs and master TFs bind simultaneously. To do this they would have had to investigate the chromatin state and presence/absence of master TFs in the non-signalling state, which they did not. Our paper is the first to address this issue. Moreover, the Young paper (PMID 22036565) favours the pre-binding model as it states that master transcription factors help direct SMAD3 binding by establishing open chromatin that contains SBEs, allowing SMAD3 to bind DNA and form a physical complex with the master transcription factors. As a result of these papers the dogma developed in the field that SMADs act passively and only bind to already accessible chromatin. Our paper overturns this dogma and is the first to show that the SMADs bind closed unacetylated chromatin and displace nucleosomes. The reviewer mentions that it has previously been reported that FOXH1 is recruited to chromatin following Activin signalling (PMID: 21741376). These authors did report inducible binding of FOXH1 and SMAD2/3 at the EOMES and GSC genes in human ESCs. However, the predominant increase in FOXH1 binding that correlates with SMAD2/3 binding actually occurs at 24 hr post Activin stimulation. Therefore, it is not clear how this relates to the rapid simultaneous binding of FOXH1 and SMAD2 at closed chromatin that we observe. Moreover, they interpret the role of FOXH1 as a pioneer factor (see Discussion of Kim et al), which is not what we conclude. The reviewer also mentions a paper (PMID: 22196728) which they say reports a mechanism for Activin-stimulated recruitment of FOXH1 to closed chromatin mediated by TIFγ-SMAD2/3. However, this paper does not address FOXH1 binding at all, and even for the SMAD2/3–SMAD4 complex binding to the proximal promoter element, it is not shown how binding of TIF1γ together with SMAD2/3 at the upstream site actually facilitates this. The reviewer is correct that the interaction of SMAD2 with SMARCA4 and a functional effect on transcription has been noted previously. In fact, one of these papers came from my lab. It is not known, however, at what level SMARCA4 is required. Here we show definitely that it is required for the nucleosome displacement at SMAD2 binding sites at ‘baseline off’ target genes. We found no enrichment of H3K27Me3 or H3K9Me3 at Activin target genes in P19 cells. Because of this we did not investigate these marks further. Their absence was not due to a failure of these ChIPs though, as we did find other regions of the genome enriched in these marks, such as the HOX clusters. The paper that the reviewer refers to uses hESCs and is focused on H3K4me3, which we did not investigate. They did not investigate H3K9Me3 at all. In addition, they did observe basal H3K27me3, but concluded that it is independent of Activin/Nodal signalling. 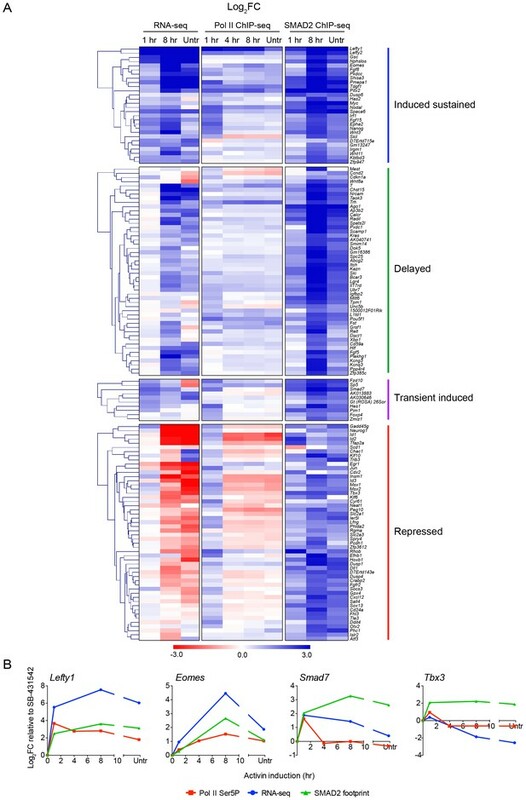 In this paper, the authors use several genome-wide approaches to investigate the mechanisms employed by Smad transcription factors to control transient gene expression profiles. A lot of data is generated and presented in this paper and from this the authors attempt to make several conclusions. However, overall, despite the large amount of work, the study lacks fundamentally new findings on how Smad transcription factors work. For example, the authors claim that Smad2 works through affecting polymerase recruitment and not pause release but the data are not entirely consistent with this view (see below). The authors also indicate that Smad binding kinetics do not necessarily correlate with gene expression profiles (and hence use different mechanisms at different genes). However, the authors do not take into account message stability which is potentially reshaping the target gene expression profiles rather than a transcriptional effect per se. Another important issue is the inclusion of "media only" effects in timecourses of activin signalling and this is not really appropriate (see below) and impacts on the interpretation of the gene expression profiles. Two of the latter findings (i.e. involvement of FOXH1 and SMARCCA4) are interesting but are already well known and studied Smad effector proteins. Overall, the current paper is therefore not conclusive enough for publication, in part through the inclusion of too much information that is not always necessary. However, with streamlining and careful re-interpretation of the data, a more coherent story might emerge. We thank the reviewer for their extremely useful insights. We have addressed all of the criticisms and comments with a large number of new experiments, as outlined in the point-by-point rebuttal below. We have also rewritten the manuscript to better communicate the novelty of the major conclusions. The point of the study was to answer fundamental questions about how transcription factor binding regulates transcription. We wanted to discover whether transcription factor occupancy induces histone modifications, or if the chromatin landscape dictates recruitment. We wanted to define the sequence of events that occur from transcription factor binding to RNA Polymerase II regulation, and discover how transcription factor binding influences the temporal patterns of gene expression in the longer term. The best way to study these critical issues is to use a system where the transcription factor binds in response to extracellular signalling, and to do this we chose to focus on Activin/NODAL signalling. In this paper for the first time we have delineated the sequence of events that occur from SMAD2 binding to transcriptional activation, and the mechanisms underlying them. We have now established three new paradigms for signal-dependent transcriptional regulation. This discovery also overturns the dogma in the field that SMADs act passively and only bind to ‘pre-conditioned’ chromatin. 3) We demonstrate that SMAD2 chromatin binding does not directly correlate with transcription of target genes, and as a result have overturned the assumption in the field that transcription factor binding linearly equates with transcriptional kinetics. The reviewer raises a valid point. We wanted to include the chronic signalling condition for exactly the reason that the reviewer states, i.e. to understand the difference between acute signalling and endogenously-generated chronic signalling. To develop a comprehensive picture of how Activin/NODAL signalling through SMAD2 regulates transcription in both the short and long term, we think that this sustained signalling condition is essential. The most important insight it has given us is that SMAD2 remains bound to chromatin as long as signalling is active and directly contributes to the transcriptional responses (see also point 6below). The issue we faced was how to plot the responses to chronic signalling on the same graphs as the acute signalling responses. We considered that it was valid to plot it as a 48 hr Activin time point as we found that the levels of pSMAD2 were the same, as were the target gene responses we measured. However, on further analysis (see Author response image 1) we found that for other genes, 48 hr of Activin after an acute response is not the same as the ‘untreated’ state. Therefore, we have now just plotted the untreated sample by introducing a gap in the graphs (see new Figures 1, 2, 4, Figure 1—figure supplement 1 and Figure 2—figure supplement 2). That way we can directly compare the responses to acute and chronic signalling without implying that the untreated state is equivalent to a 48 hr Activin time point. 24 hr and 48 hr of Activin treatment partially recapitulate the untreated condition for pathway activation and induction of target genes. (A) Western blot for pSMAD2, SMAD2/3 and TUBULIN (loading control) on lysates collected from cells treated overnight with SB-431542, followed by washout and stimulation for the indicated times with the concentrations of Activin shown, or left untreated from plating to harvest (48 hr). (B) qPCR on samples treated as in (A) for representative target genes. Plotted are the means and SEM of three independent experiments performed in duplicate. *** corresponds to a p-value of < 0.001; ** corresponds to a p-value of < 0.01; n.s., non-significant. This is a very important point that we have now explored in more detail in the revised manuscript. To sum up our results, RNA stability obviously has an impact on the RNA-seq profiles, but is not responsible for the differences between ‘induced sustained’ and ‘transient induced’. We have now measured the mRNA stability of a number of representative target genes and find no correlation between mRNA stability and the gene category (see new Figure 1—figure supplement 4 and subsection “Activin induces multiple temporal patterns of gene expression”, second paragraph). For example, T and Tdgf1 are both very stable transcripts, yet T is a delayed gene and Tdgf1 is in the ‘induced sustained’ category. Similarly, Lefty1 and Hes1 have relatively short half-lives, and are in the ‘induced sustained’ and ‘transient induced’ categories respectively. Furthermore, we have also tested whether these different transcription profiles require on-going Activin signalling – an issue also relevant to point 6below. We find that the profiles of all of the genes tested, with the exception of Id1 and Id2, require on-going signalling (see new Figure 1F and Figure 1—figure supplement 4B and C). Particularly pertinent to the issue of mRNA stability, we find that all the ‘induced sustained’ genes we looked at require on-going signalling for their sustained expression. This proves that they are not simply in the ‘induced sustained’ category because their mRNA is stable. Concerning the question of the RNA polymerase profiles, in the original version of the paper we had looked at the Pol II Ser5P profile across the gene clusters (Figure 4A), and observed clear differences between the 4 categories. Most importantly, in the ‘transient induced’ category, the Pol II Ser5P enrichment for the majority of the genes decreases dramatically after 1 hr Activin as expected. For the ‘induced sustained’ category, for some of the genes the Pol II Ser5P enrichment remains high; for others there is a decrease in Pol II Ser5P enrichment after 1 hr (consistent with the observation that the rate of RNA production decreases after 1 hr for these genes – see subsection “Activin induces multiple temporal patterns of gene expression”, third paragraph), but it is not as pronounced as for the ‘transient induced’ genes. All experiments have been performed at least twice and the vast majority three or more times. This is now explicitly stated in the Materials and methods (subsection “Statistical Analysis”). In the revised version of the manuscript we have now presented combined experiments for the majority of experiments rather than representative ones (see new Figures 1E, F, 5D, E, 7A, C, D, 8A, B, Figure 1—figure supplement 2C, Figure 1—figure supplement 3, Figure 1—figure supplement 4, Figure 4—figure supplement 1, Figure 7—figure supplement 2A, Figure 5—figure supplement 1, Figure 7—figure supplement 3 and Figure 8—figure supplement 1). For the data in Figure 5F, Figure 7E and F and Figure 8C and D, we show representative experiments to keep the spatial information and then plot the combination of the three experiments at the 5’ to SBS and 3’ to SBS (for the data in Figure 7E and 8C) or the SBS (for the data in Figure 5F, Figures 7F and 8D) to be able to demonstrate the statistical significance of the data. Note that for the spatial experiments like those shown in Figures 5F, 7E, 7F, 8C and 8D, if everything was normalized to the SB-431542 values, then the differences between the SB-431542 samples for different regions of the same gene and for different genes would be lost. It was to avoid these sort of losses of information resulting from normalization that we had originally opted to show representative experiments. The only experiments that we are still showing as representative experiments are: time courses like Figure 2G for example, which as the reviewer states the adjacent timepoints act as replicates; and experiments which are validations of whole genome analyses, where we wanted to test the exact same mRNA or genomic DNA used for the NGS experiment. Assuming that the reviewer is referring to the SMAD2 ChIP-seq experiments, then the replicates were very good, but the enrichment in the second biological replicate was significantly lower across the whole genome. This is obvious looking at the scales in Figure 2—figure supplement 1. Because of this, some of the smaller peaks were not called by MACS in the second dataset, but were present upon visual inspection. Thus, the final list of SMAD2 peaks was generated using the MACS-called peaks for the four time points of the first dataset. We have also validated a subset of them by qPCR (Figure 2—figure supplement 1). Note that when we defined the high confidence dataset of target genes and associated binding sites, we took into account the SMAD2 peaks conserved between the two biological ChIP-seq replicates within 100 kb of an annotated TSS or TTS (see subsection “Definition of the high confidence dataset of target genes and associated binding 877 sites”). For the other ChIP-seq experiments, both biological replicates were used by the DiffReps program to identify the statistically significant loci of enrichment (see subsection “Pol II (Ser5P and Ser2P) and H3K27Ac/H3K9Ac ChIP-seq analysis”, first paragraph). Concerning the merging of SMAD2 peaks. We used a minimum of 1 bp as an overlap, but as now stated in the text (see subsection “SMAD2 peak calling, annotation and generation of a SMAD2 consensus peak list”, second paragraph) the majority of peaks have a sizable overlap and the mean is 200 bp (see Author Response image 2). The idea behind this was not to define specific SMAD2 binding loci, but to define activity loci that applied across the different time points. The reviewer says that there is clear evidence of a paused polymerase in the inhibited condition at the TSS of the ‘baseline on’ genes. I think there may be a difference in interpretation here. The reviewer appears to suggest that a peak of Pol II Ser5P at the TSS per seis a sign of a paused polymerase. However, this is not the case, and to clarify the situation we have now added metaprofiles for Pol II Ser2P (see revised Figure 3). The profile expected for a paused polymerase is a peak of Pol II Ser5P at the TSS, with no enrichment in the gene body and also no Pol II Ser2P enrichment at all (Sawicka et al., 2014, PMID 25135956). For the ‘baseline off’ genes, the critical result is that there is no peak of Pol II Ser5P at the TSS and no Pol II Ser2P in the SB- 431542-treated state. Therefore, activation of these genes must be via Pol II recruitment, as the reviewer states (see new Figure 3D). The ‘baseline on’ genes, in contrast, in all conditions show the typical active gene profile (see new Figure 3D), which is exemplified by the Pol II Ser5P and Pol II Ser2P profiles shown in Figure 3A. These genes show a peak of Pol II Ser 5P at the TSS and TTS with enrichment in the gene body and enrichment of Pol II Ser2P in the gene body with a peak at the TTS. This is not consistent with a paused polymerase in the SB-431542-treated state, or in any other condition. Most importantly, for these ‘baseline on’ genes, Activin/NODAL signalling does not change the shape of the Pol II Ser5P and Pol II Ser2P profiles. It simply changes the amplitude, which reflects changes in Pol II recruitment. This is also the case for genes in the other categories. See subsection “Activin/NODAL signaling regulates Pol II via recruitment”, second paragraph. Thus, we conclude that the step regulated by NODAL/Activin signalling is Pol II recruitment. We have not performed ChIP-seq with an antibody recognizing total RNA polymerase as we consider that using the antibodies specific to the different forms is more informative. We thank the reviewer for these comments as they inspired us to perform an SB- 431542 chase experiment that has been incredibly informative, and has provided critical evidence to support our claim that SMAD2 recruits additional factors to shape subsequent responses. To discover whether Activin/NODAL signalling through SMAD2 induces an initial transcriptional up-regulation that is then modulated through other factors, or whether the long-term responses require continuous signalling, we treated cells for 1 hr with Activin and then with or without the type I receptor inhibitor SB-431542 for different times. The results are very striking (see new Figure 1F and new Figure 1—figure supplement 4 and subsection “Activin induces multiple temporal patterns of gene expression”, fourth paragraph). Taking representative examples of target genes in each of the four categories we found that inhibiting signalling after 1 hr of Activin stimulation had a dramatic effect on the subsequent transcriptional profile of the target genes. ‘Induced sustained’ genes require continuous SMAD2 signaling for their long-term transcription, and ‘delayed’ genes require extended signaling to be induced at all. For ‘transiently induced’ genes like Smad7 and Hes1 we found that when signaling was terminated after 1 hr their levels fell rapidly to baseline, presumably because of the very short half-life of these mRNAs, whereas in the context of on-going signaling, these genes were repressed in a much more gradual fashion. Transcriptional repression of genes like Fgfr2 also requires on-going signaling, although not for Id1 and Id2. These new data provide a functional explanation for the presence of continued SMAD2 on the regulatory regions of all these classes of genes. 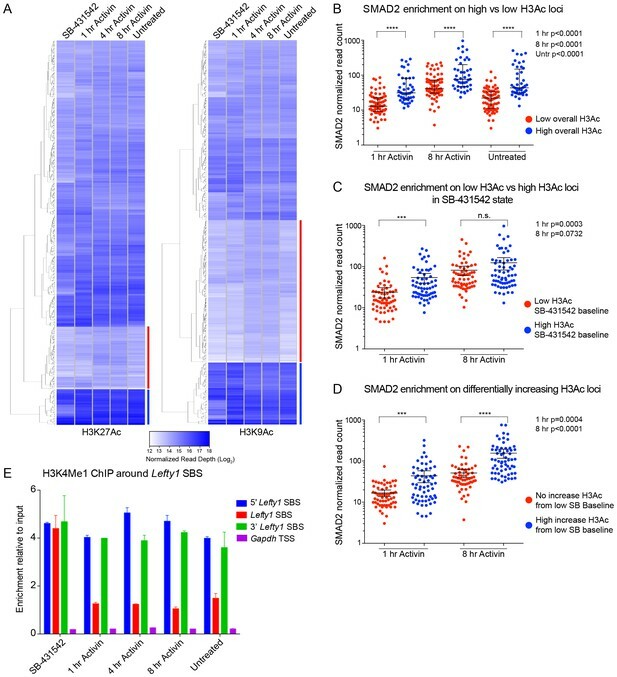 Crucially, these data demonstrate that for most genes, long-term modulation of the response requires SMAD2 activity and thus is likely elicited by SMAD2-mediated recruitment of additional factors. We have now performed additional experiments and analyses to convincingly show that SMAD2 does exhibit two distinct modes of binding. The reviewer considers that the chromatin is already open in the ‘baseline off’ samples (which is 29 genes, corresponding to 99 regions). This is not the case, as it is clear that Activin induction results in a dramatic decrease in H3 occupancy at these SBSs and also a substantial induction of acetylation in the flanking nucleosomes. To corroborate this result we subdivided this category of SBSs further to focus on those whose acetylation is highly induced upon signal induction (see Figure 6D). In this new metaprofile (Figure 5B, right hand panels) the depletion of H3 at the SBS is even more pronounced (more than 2-fold), as is the ligand-induced flanking acetylation. Furthermore, we have now analysed by ChIP-PCR the H3 enrichment ± Activin induction for the genes for which we show the FAIRE. It is clear that H3 levels for Lefty1 and Pmepa1 are uniformly high at the SBS and 5’ and 3’ flanking nucleosomes in the absence of signalling and that Activin induction results in nucleosome displacement at the SBS (see new Figure 5—figure supplement 1). The nucleosome depletion at the SBSs for these two genes is also evident in the IGV profiles (Figure 5A and Figure 5—figure supplement 2). Taking all these results together, we believe that we have convincingly demonstrated that activated SMAD2 binds to closed unacetylated chromatin, where it induces nucleosome eviction and histone acetylation. We have not performed FAIRE genome-wide. This is an interesting issue. The point we were making was that FOXH1 is not pre-bound and acting as a ‘landing pad’ for the activated SMAD complex. Given that both FoxH1 and the activated SMADs bind simultaneously and they are interdependent on each other for binding, it is impossible to say which component is responsible for accessing the closed chromatin. One of the other key results in the paper is that SMARCA4 is required for opening up of the chromatin at some of these loci and it is SMAD2 that interacts with SMARCA4. We now favour a model of dynamic assisted loading as hypothesised by Swinstead et al. 2016 (PMID 27633730), which we mention in the first paragraph of the subsection “The role of SMAD2-cooperating transcription factors”. Our data show clearly that the induction of H3K27Ac and H3K9Ac after 1 hr Activin are similar and correlate with initial SMAD2 binding (see metaprofiles for all SMAD2 peaks in Figure 5B). The reviewer is right that the longer-term patterns are different for the two marks, possibly reflecting activities of different deacetylases. This is a very interesting issue, but we feel that it is beyond the scope of the current manuscript. Lefty1, Lefty2, and Pmepa1, are in the ‘baseline off’ category; the others are in the ‘baseline on’ category and are there for comparison. This is now made clear in the text (see subsection “SMARCA4 is required for nucleosome eviction at a subset of SMAD2 binding sites”). The categories for a given gene are in Supplementary file 1. We have now combined the biological replicates for both Figure 7 and Figure 8 (see also response to point 3 above and see Figure 7—figure supplement 3 and Figure 8—figure supplement 1). It is clear in Figure 8 that the dependency on SMARCA4 for transcription fits with the dependency for SMAD2 binding. We have clarified this in the text (see subsection “SMARCA4 is required for nucleosome eviction at a subset of SMAD2 binding sites”). We have now combined the FAIRE data to be clear about the statistical significance (see Figure 8D and Figure 8—figure supplement 1B). The reviewer is right, the FAIRE signal changes similarly at Pitx2 and Smad7 in the ligand-induced state despite the different baselines. However, the reduction in accessibility in the absence of SMARCA4 seen for these two genes is clearly not sufficient to affect ligand-induced transcription, SMAD2 binding or local histone acetylation (see Figure 8). The reviewer is also correct to say that there are effects of depleting SMARCA4 on the baseline, and thus it may have a general role in chromatin opening. Nevertheless, on top of this, SMARCA4 is essential in the case of the three ‘baseline off’ genes, Lefty1, Lefty2, and Pmepa1, for ligand-induced SMAD2 binding, histone acetylation, chromatin accessibility and transcription. We have now clarified this in the text (see subsection “SMARCA4 is required for nucleosome eviction at a subset of SMAD2 binding 476 sites”). […] 1) Activin/nodal signaling induces phosphorylation of Smad2 and Smad3 (as described in the third paragraph of the Introduction of this paper). However, the authors analyzed binding of Smad2 to chromatin but not that of Smad3. Is it appropriate to discuss activin/nodal signaling only referring Smad2? They should explain in the main text why they omitted arguments about Smad3. Other ChIP-seq papers on activin/nodal signaling analyzed both Smad2 and Smad3. The reason that we concentrated on SMAD2, was that there are undetectable levels of SMAD3 in these cells. This is obvious in all the Western blots in the paper where we used an antibody that recognizes SMAD2 and SMAD3 equally (BD 610843) (see for example, Figure 1A and Figure 1—figure supplement 1A). To make this point even more strongly we have prepared a figure (Author response image 3A) where we have Western blotted extract from P19 cells alongside extracts from two other mouse cell lines, C2C12s and EpH4s. It is clear that SMAD3 is undetectable in P19s, but readily detectable in the other two lines. The levels of SMAD2 are comparable in all three lines. We have now stated in the text that we have focused on SMAD2, as that is the predominant R-SMAD downstream of Activin/NODAL in these cells (see Introduction, last paragraph). A) P19 cells express low level of SMAD3.Western blot for SMAD2/3 and TUBULIN (loading control) on lysates collected from three different mouse cell lines, the myoblast line, C2C12, the mammary epithelial cell line, EpH4 and P19 cells. Note that P19 cells express similar level of SMAD2 compared to the others cell lines, but undetectable levels of SMAD3. B) Characterization of the in house FOXH1 antibody. Lysates were collected from wild type P19 cells transfected with either non-targeting (NT) or Foxh1 siRNAs and from P19 cells stably expressing MYC-tagged FOXH1 (see Figure 7—figure supplement 2B–D). Shown are Western blots for FOXH1, MYC and TUBULIN (loading). Note that a band at the predicted molecular weight of FOXH1 is detected in the P19 MYC-FOXH1 sample when incubating the blot with either anti FOXH1 in-house antibody (left panel) or anti MYC antibody (right panel). Note that the levels of endogenous FOXH1 are below the threshold of detection in Western blots for the anti FOXH1 in-house antibody. As explained above, we find SMAD3 to be undetectable in P19 cells. We show that for the ‘baseline off’ genes that there is no Pol II enriched at the TSS’s of target genes when the pathway is switched off with SB-431542, but that Pol II Ser5P becomes enriched at the TSS and in the gene bodies upon Activin stimulation. Because SMAD2 is the major R-SMAD, we ascribed the activity to SMAD2. However, to make the result more general we have rewritten the text to state that Activin/NODAL signalling regulates target gene expression through de novo recruitment of Pol II (see subsection “Activin/NODAL signaling regulates Pol II via recruitment”, last paragraph). We validated the antibody in several different ways. It is not quite sensitive enough to see endogenous FOXH1 in a Western blot. However, as we show in Author response image 3B, it clearly recognizes Myc-FoxH1 in a stably overexpressing P19 cell line by Western blot. It immunoprecipitates very effectively and most importantly, we see similar results in FoxH1 ChIPs in the absence and presence of ligand stimulation when we use our anti-FoxH1 antibody on wild type P19 cells or the Myc antibody in the P19 cell line that expresses Myc-FoxH1 at approximately endogenous levels (compare Figure 7C with Figure 7—figure supplement 2D). We thank Liliana Attisano for the Myc-Foxh1 plasmid, Thodoris Petrakis for generating the MYC-FOXH1 cell line and Marc-Sebastian Walter for help in generating the Lefty1/2 SBS deletion lines. We are grateful to the Francis Crick Institute Genomics-Equipment Park and to members of the Advanced Sequencing Facility. We thank Stuart Horswell for advice and Francesco Gualdrini, Mike Howell and members of the Hill lab for comments on the manuscript. This work was supported by the Francis Crick Institute which receives its core funding from Cancer Research UK (FC001095), the UK Medical Research Council (FC001095), and the Wellcome Trust (FC001095). In addition, this work was supported by the European Commission Network of Excellence EpiGeneSys (HEALTH-F4-2010-257082). We confirm that none of the authors have any financial interest in this work. © 2017, Coda et al.